In 1984 a group of naturalists in the Ottawa Valley formed this club to share their knowledge and love of nature. 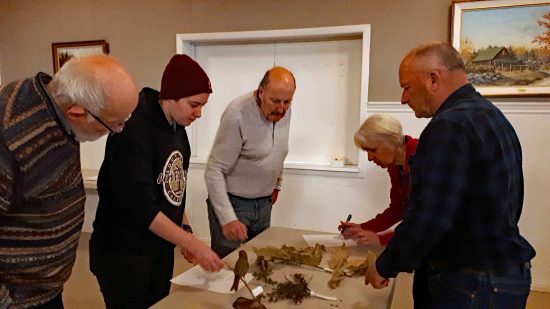 Following in the footsteps of Charles Macnamara (1881-1944), a naturalist and photographer who lived in Arnprior, our club has explored, documented and enjoyed the natural history of our area. Welcome to our club! 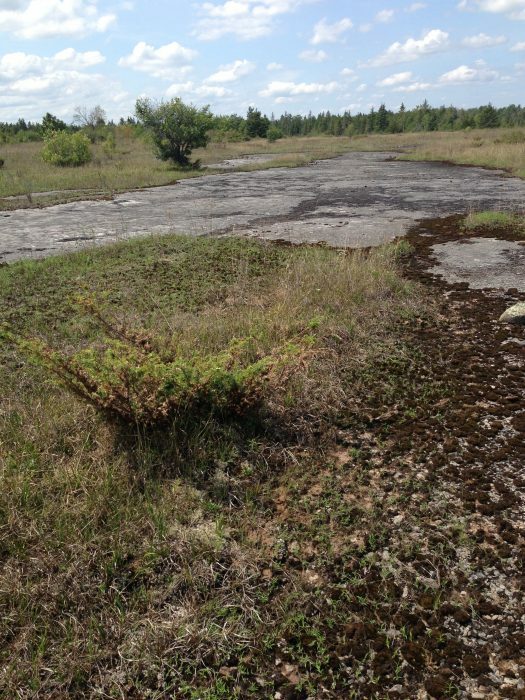 The Macnamara Trail in the southeast corner of Arnprior is a window into the past and present natural world of the region. One of the club’s largest projects to date, its boardwalks, viewing platforms, and benches – constructed entirely by volunteers – allow visitors to explore it without disturbing its wild character. Expert speakers share their knowledge and take us in easy steps into their special worlds at club meetings. 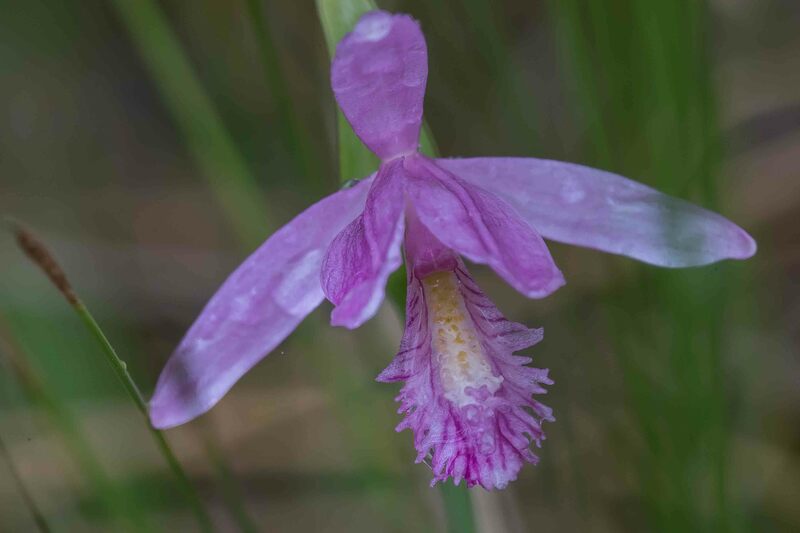 Field trips throughout the year investigate everything from geology, to birds in migration, to rare orchids. Check out our upcoming events and meetings. We are pleased to share our knowledge and experience with you! 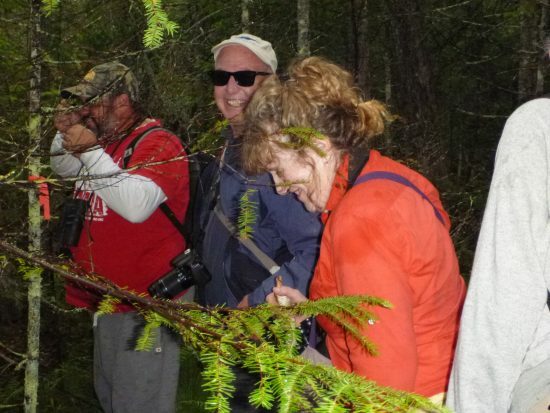 On Saturday, April 21, a lively group of adults joined their enthusiastic kids/grandkids for an evening adventure on Linda Sewell's beautiful property. We arrived at 8pm (a real treat for some of the little ones who are often in bed by then!) and made our way to a nearby field just before the sun set. Jeff Skevington led us on a birding walk and we were lucky to hear American Woodcock and 4 species of owl. 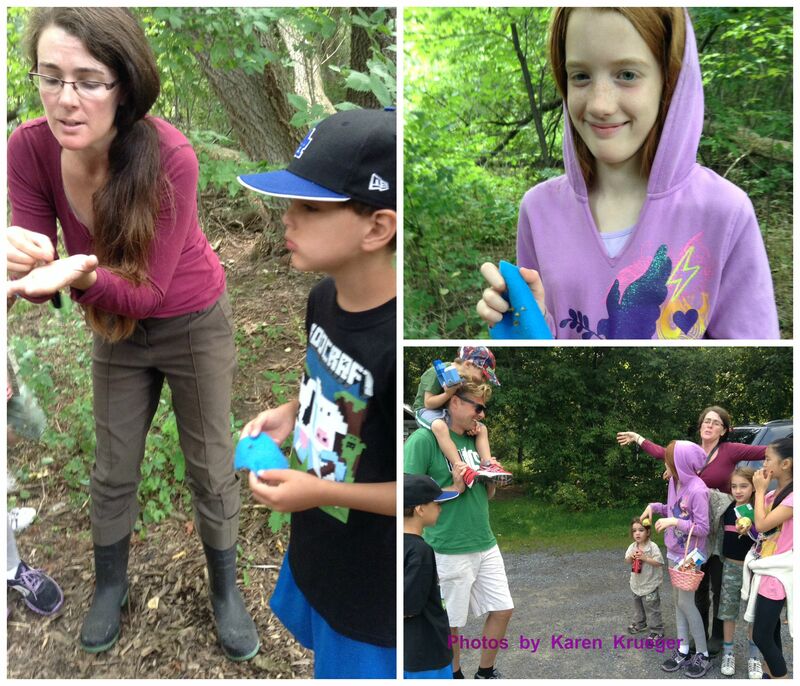 The Young Macs got to try their Barred Owl calls and some were not bad at all! 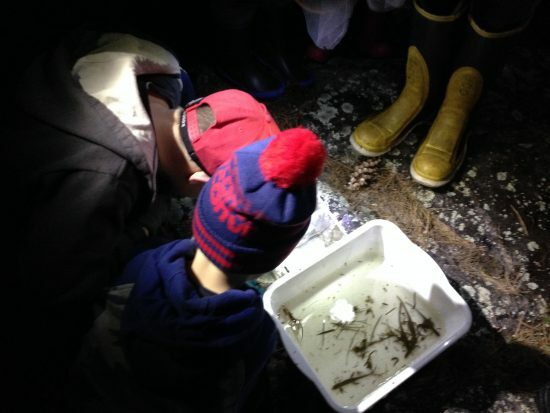 Once the darkness settled in we went back to the ponds where Angela Skevington organized the Young Macs in a very fun search of the ponds where they collected specimens and put them, temporarily, into pans so that everyone had a good look and learned how to identify each species. 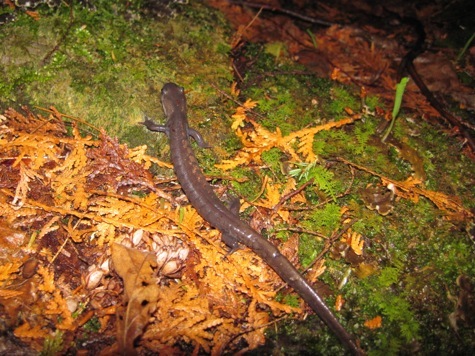 Many Eastern Newts were found along with numerous insects, such as water boatmen, predacious diving beetles and a water scorpion. 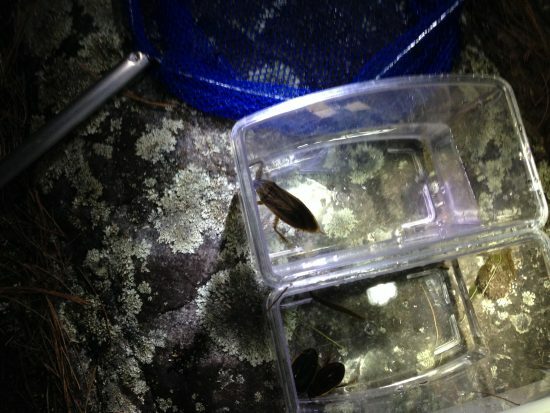 Drawing the greatest attention though was a diving water bug, best known to the kids as the "toe-biter". Interestingly for this time of year, we did not see or hear a frog. They are very late this year. Many thanks to Angela, Jeff and Linda for a memorable evening. It’s amphibian time of year! A chorus of frogs has erupted in the woods and wetlands. The Young Macs were delighted to have Matt Ellerbeck, from Save the Salamanders to talk about how to help our amphibian friends. It was a beautiful spring day but nice and cool in the barn, the preferred salamander conditions. 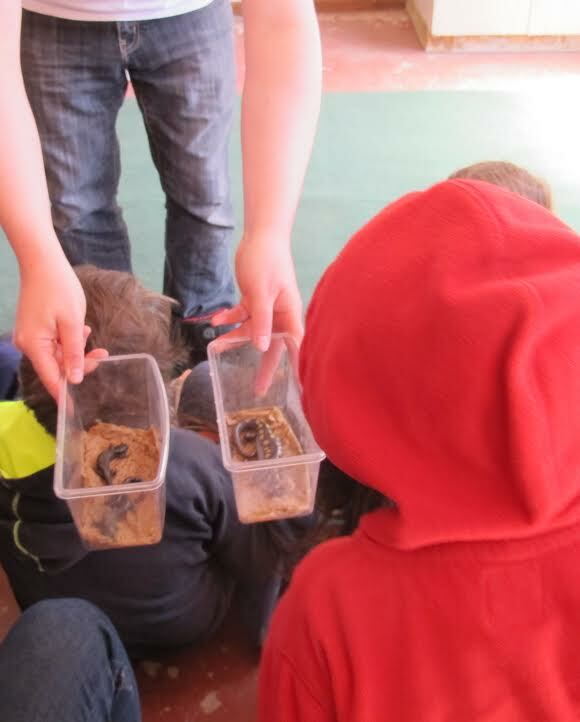 The kids were delighted to get to see various species including those that might be hiding in their own backyards. This was followed by the Frog and Salamander walk the next day as part of the regular Macnamara outings. 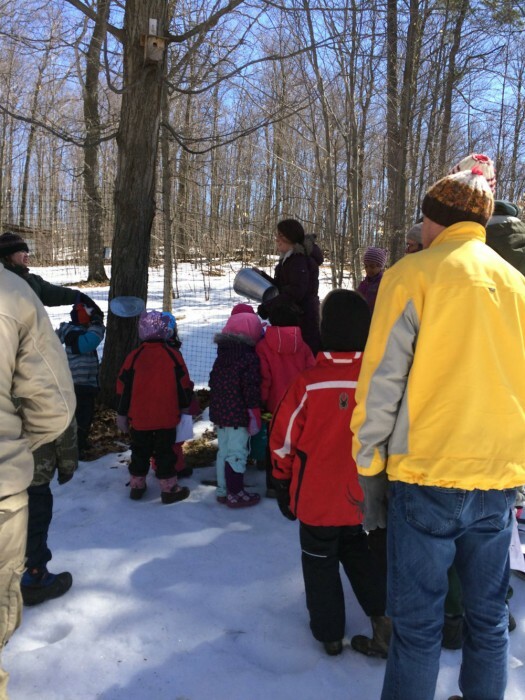 We had a great time in our old fashioned sugar bush. 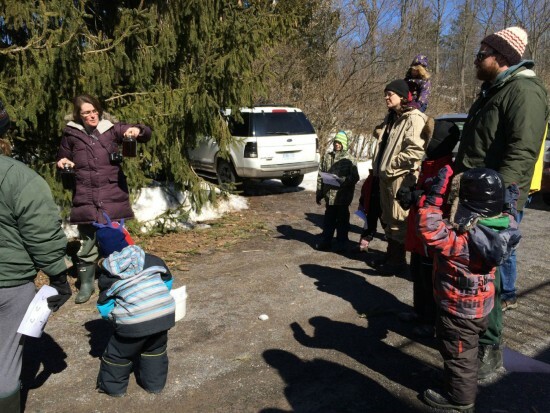 We discussed the importance of temperatures oscillating below zero Celsius at night and above during the day so that there is alternating between sucking up water from the ground during the night and pushing out sap during the day. 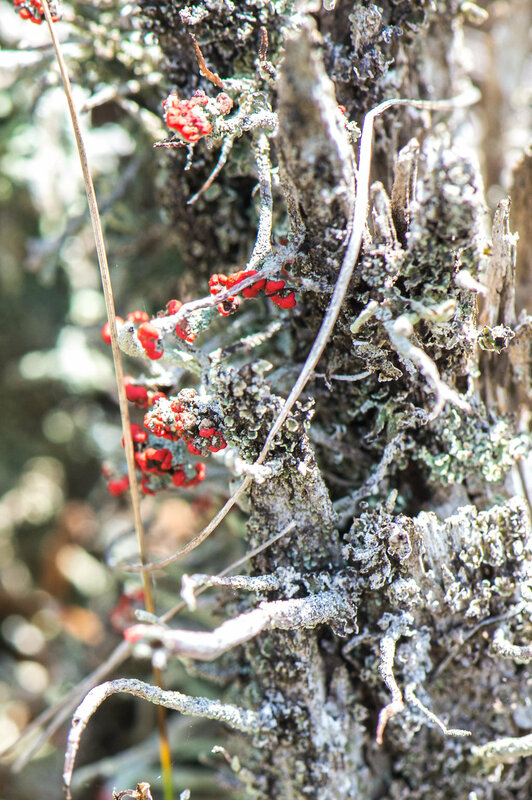 It was too cold for any sap flow on our walk that day. 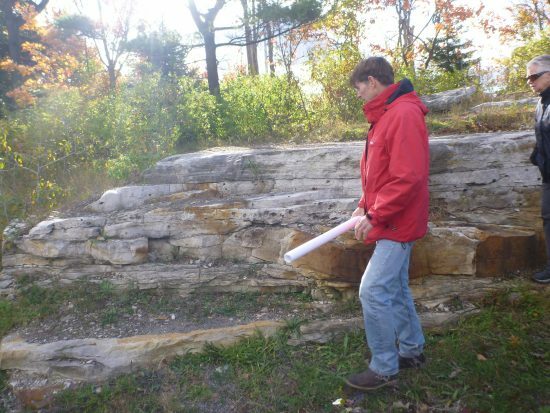 For more on this process and how Carbon dioxide is involved, see this article on sapflow. 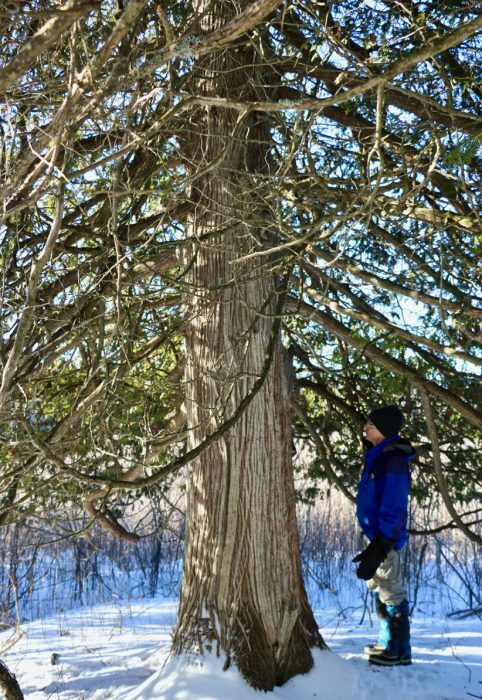 We looked at how we tap about 3 feet up on the sunny side of the larger trees, ideally under a large limb. And we talked about the 40:1 ratio of sap to syrup. 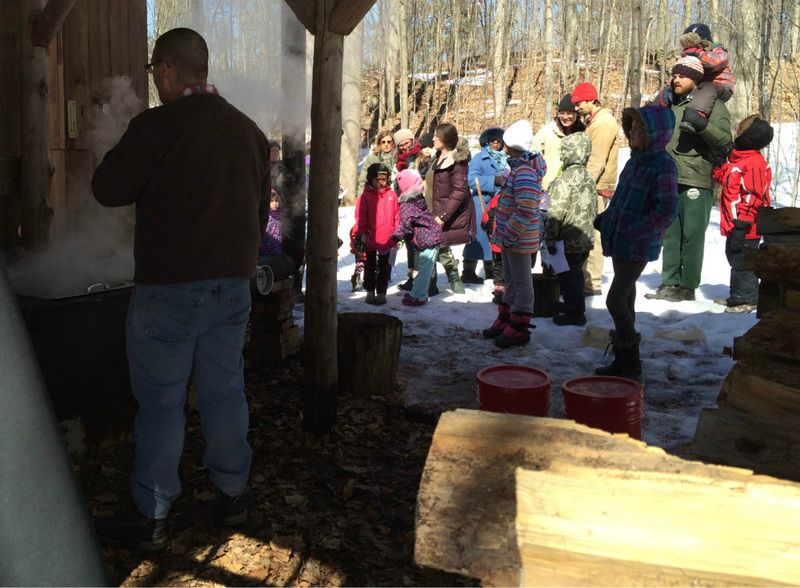 Then we watched the evaporator at work boiling and concentrating the sugars from the sap collected during the week. 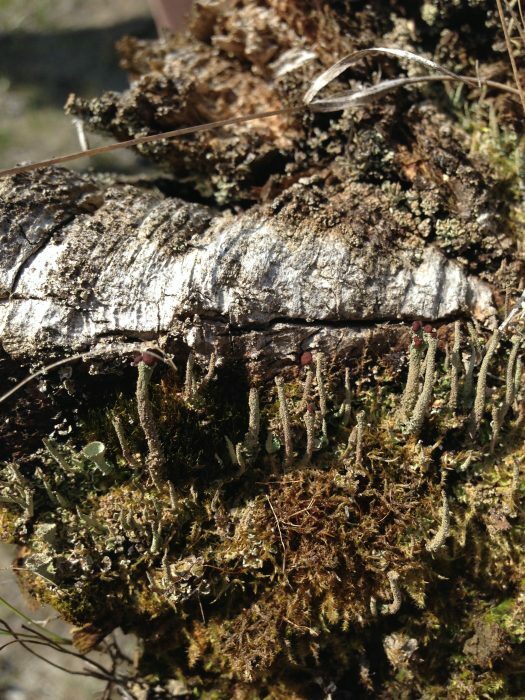 Several degrees below zero, but sunny, some of the items on our winter scavenger hunt were hiding so we didn’t see any geese or ravens but we did find winter damage, moss, ferns, metamorphic rock, beech trees, evidence of squirrels, and woodpecker holes. After visiting a very old maple, entirely hollow up the main trunk and covered in moss, we headed back to sample some maple syrup: the first boil of 2016 and the last of 2015. It was a close contest but I think first boil of 2016 won by a few votes. Lots of Young Macs and their parents turned out for another beautiful walk though very different weather than last time as winter’s chill was in the air. There was even a sprinkling of snow. We started off discussing the dynamics of flight including looking at the shape of the wing and feathers using a model and an actual chicken wing. The fun with feathers did not stop there as we tested their insulating quality by sticking our hand in a container full of down. Fun but a little messy! 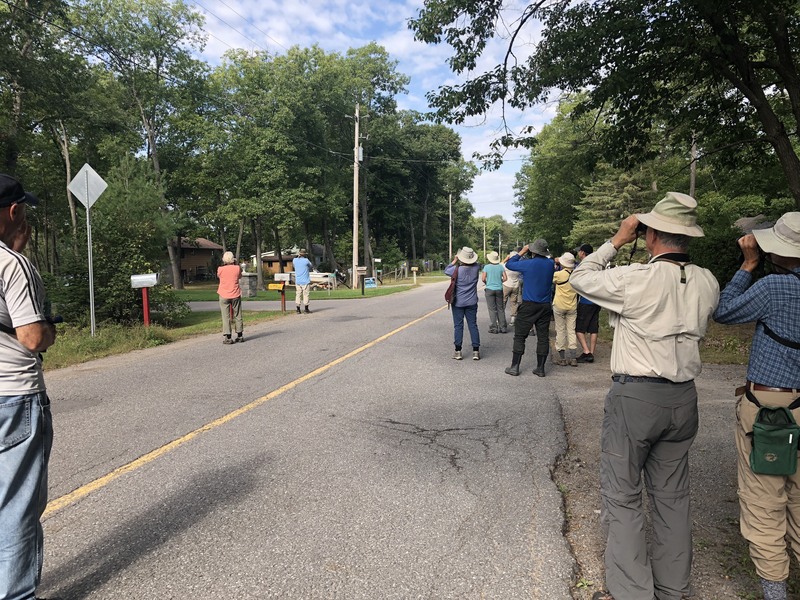 We also discussed why birds migrate before heading out to see some water birds on the shore of Fitzroy Provincial Park. 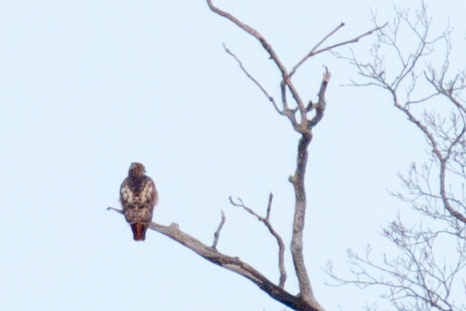 There was a flock of Canadian geese, and a few red heads too! A big Osprey nest, with its Corvid look out, also drew everyone’s attention. 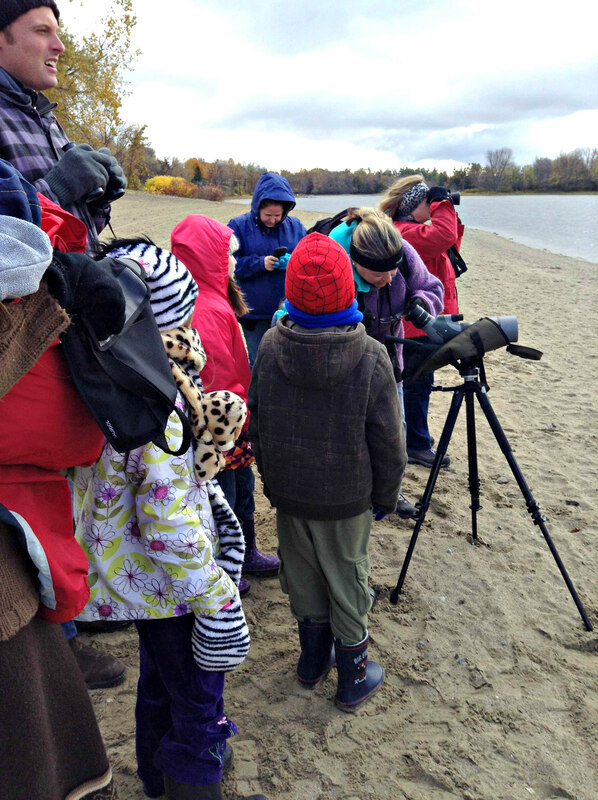 The kids jumped from rock to rock, traced the goose footsteps, talked about the changing colour of autumn leaves and tried their hand at binoculars. Afterwards we all retired to Karen Krueger’s house for some hot chocolate and cookies. A special thanks to all the Mac mentors that brought their equipment and expertise and to our host! Written by Telsing Andrews. 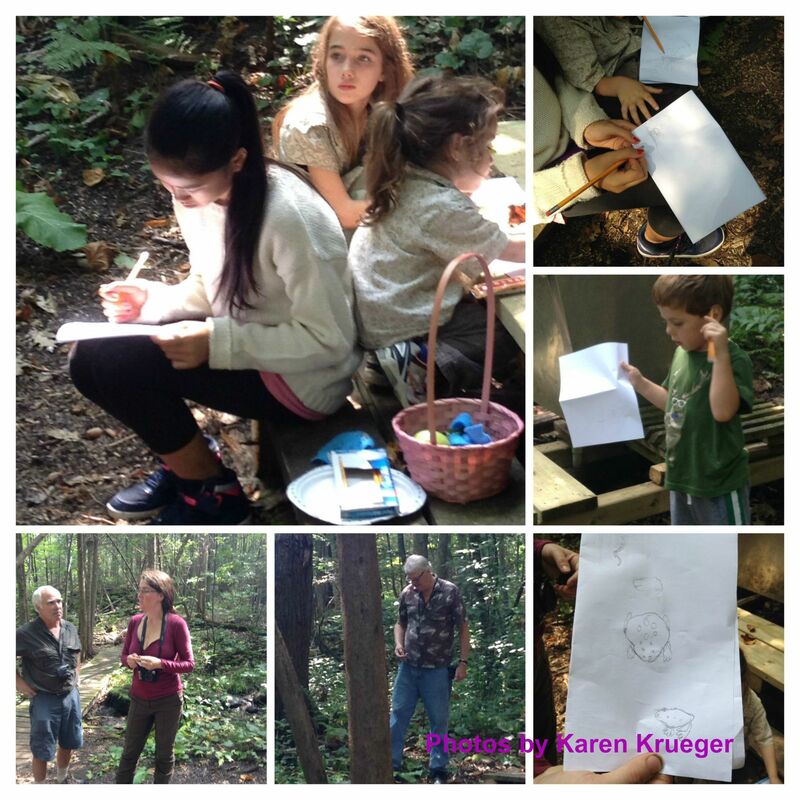 Photos by Karen Krueger and Betty Michalowski. We had a wonderful if muggy morning on September 5, 2015, exploring seed distribution on the Macnamara Trail. 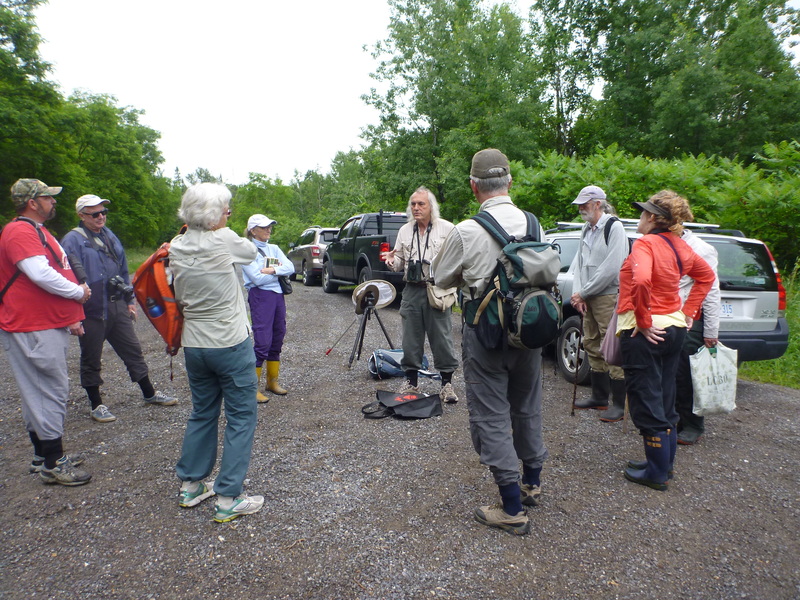 After discussing the importance of seed movement, we caught some burdock, enchanter’s nightshade and beggar’s ticks on pieces of felt, tossed around some maple samaras, and exploded jewelweed pods – abundant at the trailhead. 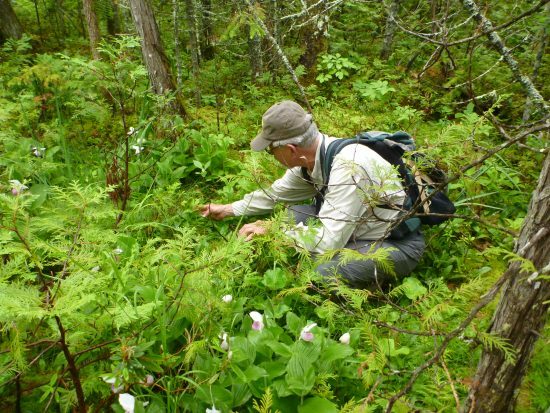 As we walked along, the hard fruit of basswood fluttered down. 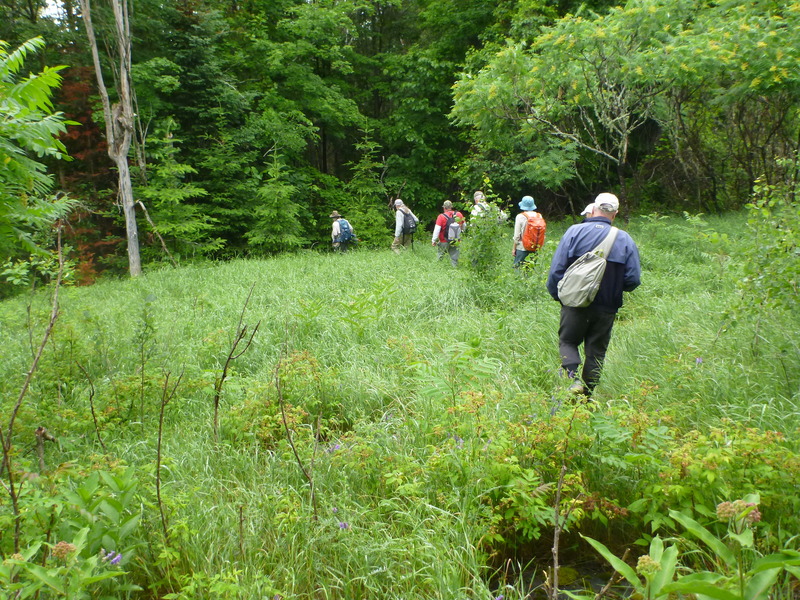 We stepped on buckthorn fruit and were tempted by flowering raspberry. 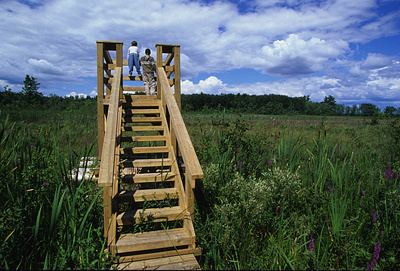 Across the first boardwalk, we encountered cattails starting to fluff and fly away in the wind. Steve Duffield showed us various trees along the trail including balsam fir, black cherry and yellow birch. 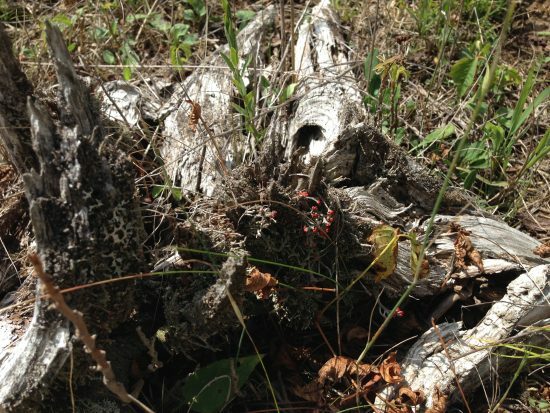 As the trail headed upland, we encountered the most magnificent fungal flush. We weren’t the only ones there to appreciate the sights. 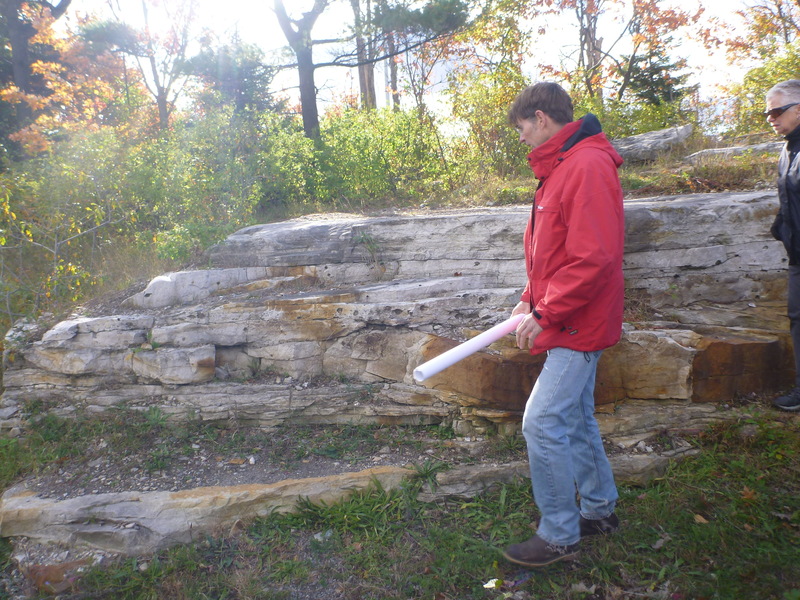 A group of myco-enthusiasts were also there taking a survey. There were plenty of large mushroom specimens including various Lactarius including L. indigo, some Amanita such as fly agaric and Russula. 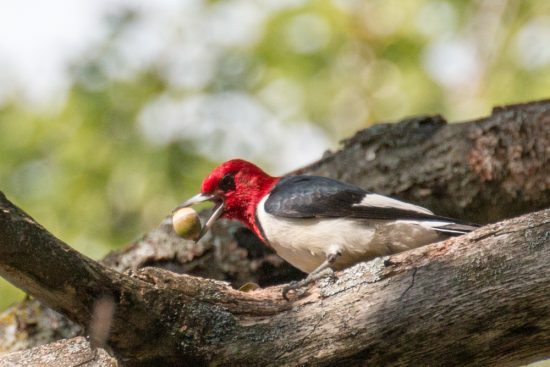 At the bird feeders, we stopped to do a little drawing and to open some red oak acorns on a hunt for acorn weevil larva. Then it was off to the boardwalk lookout. There were plenty of toads, chipmunks and a garter snakes sighted too. More animal signs included piles of pine cone scales, snapped branches off oak trees, a gnawed bone and bark with pileated woodpecker holes and the daintier orderly ones from a sapsucker. 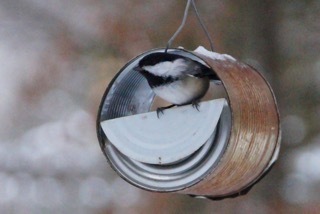 The sounds of chickadees accompanied us back. Ontario Nature is holding its fifth annual youth summit to bring young leaders across the province together for a weekend of building friendships, learning and outdoor activities. Click here to register online or here to register offline. Registration will close on Monday, September 8 or when the event reaches its capacity. Refunds will not be issued for cancellations after September 8. Interested in more details? Click here for answers to some Frequently Asked Questions. 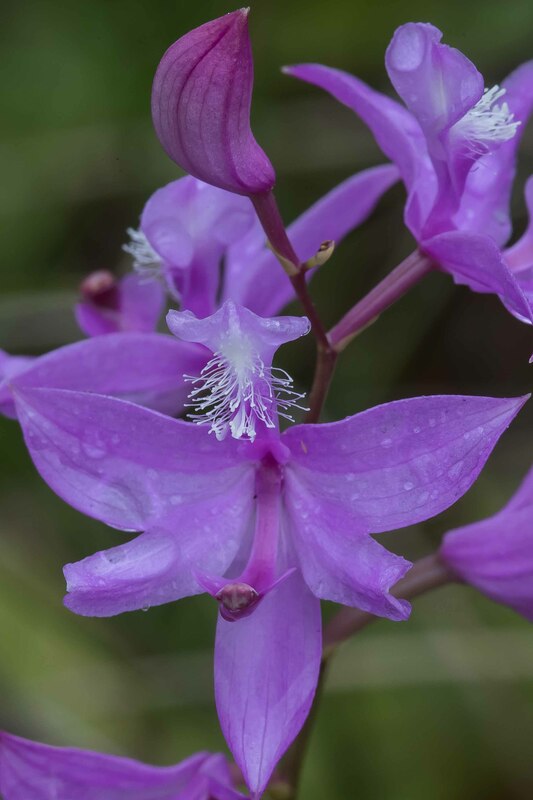 We started out on the cold, windy Stonecrest Road, Near MacLaren Side Road, where the Spring Peepers and Wood frogs were in full song. 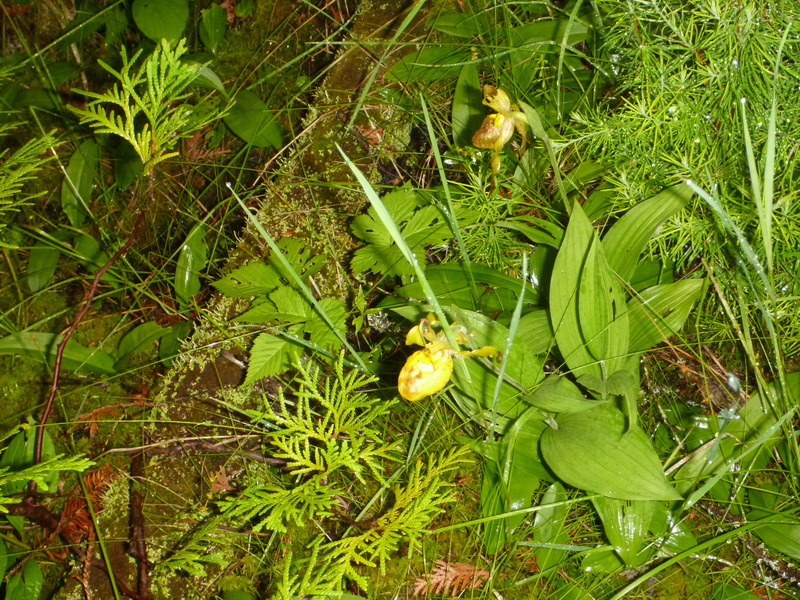 I heard one or two Chorus Frogs when I first arrived, but none during the event. Thanks to Jeff and Angela, we also did a quick pond study with a host of Caddis fly larvae, mosquito larvae, Amphipods and some water boatmen beetles, among others. 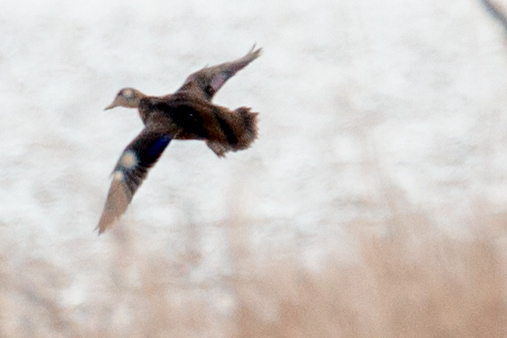 Due to wind and cold, few birds were seen and heard(a few ducks). Of great interest to Jeff and I was the unusual appearance of 9 Rusty Blackbirds in a pine tree at the corner. They stayed there for most of the time we were present. 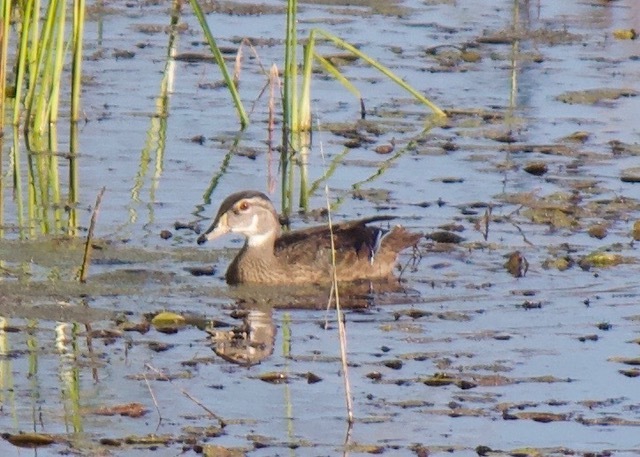 This was reported to Ebird, making our field trip a significant birding event as well! 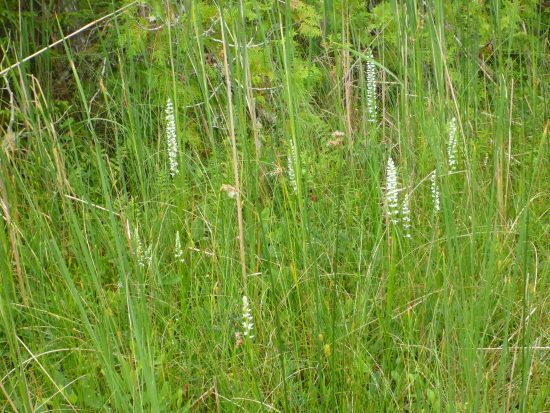 As darkness fell and coldness amplified, we convoyed to Mrs. Duffields, and marched into the ponds at the forest edge. Steve gave short review of maple syrup production before we moved onto the pond, where a kidlet captured a spotted salamander before the whole group made it down to the pond. 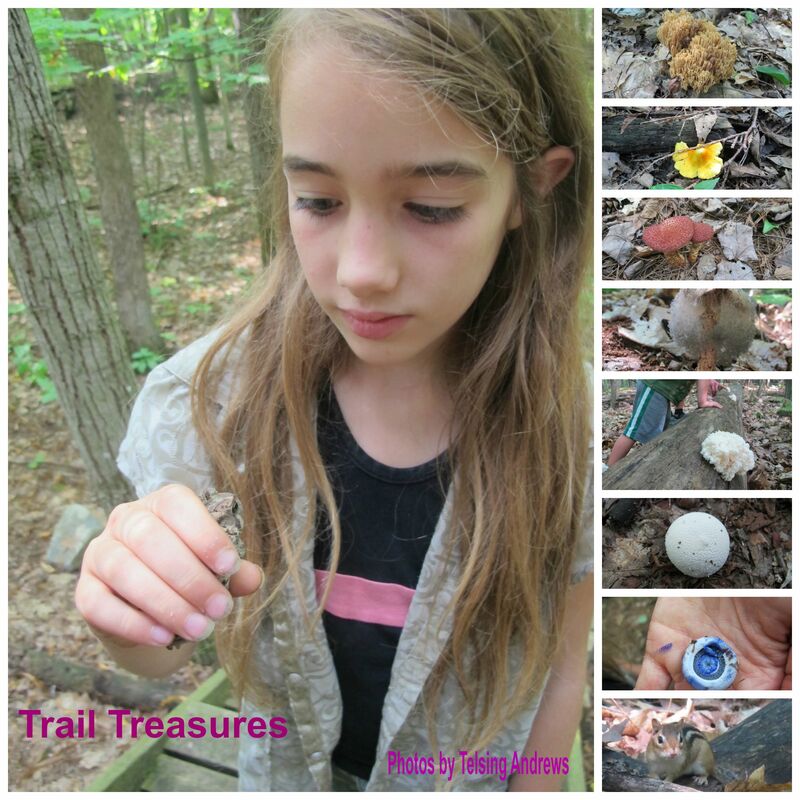 Kids were having a ball, and yet being respectful to the animals, as we found more and more. 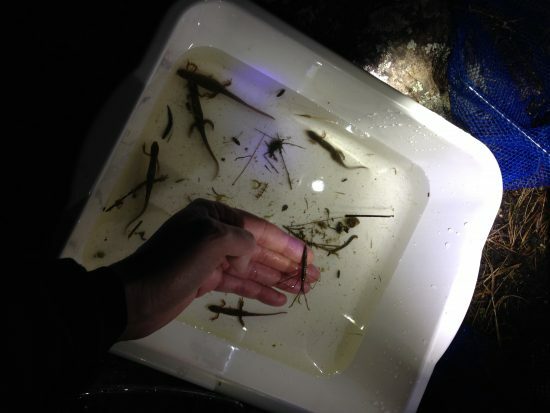 Jeff was able to net a blue-spotted salamander and a newt, to show everyone and round out the evening. 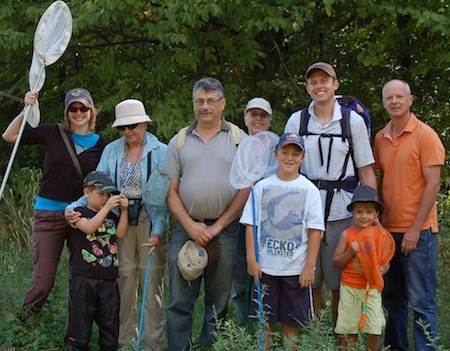 We even captured a Hellagrammite (Dobson Fly larva) which impressed several of the younger crowd. Spring Peepers and Wood Frogs abounded, and we were able to net several for quick view. Thanks again to Steve and Mrs Duffield for being such welcoming hosts. There were a few wet feet, nothing serious. All the kids, young and old, were very excited, asked a lot of questions and were very much happy with the event which closed down at about 9:30 PM. 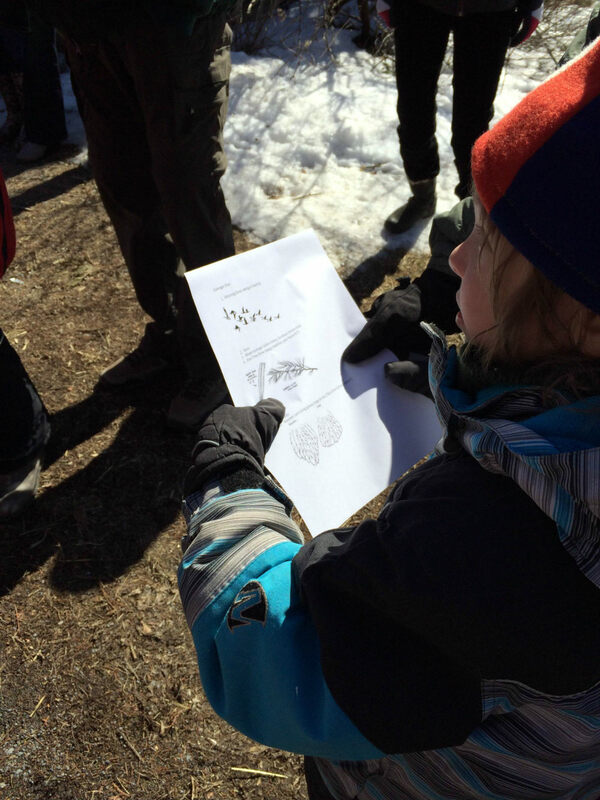 On Saturday, January 5th, the YMs spent the morning identifying birds on the Macnamara Trail in Arnprior. 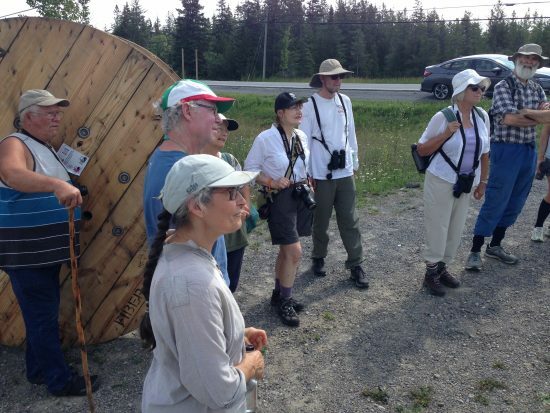 The very first bird we saw was the local and ever charismatic Black-Capped Chickadee. Walking along the trail, we decided to head directly to the bird feeders to see what we could see, and return at a slower pace. 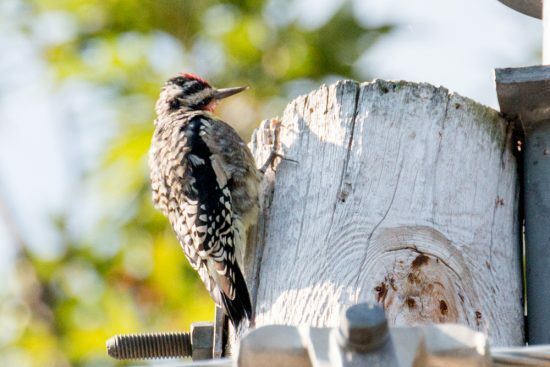 At the feeders, we were happy to see a small variety of birds waiting for us. 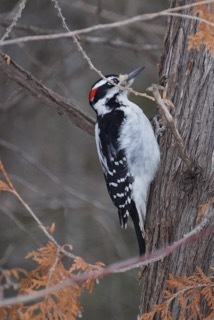 Several Chickadees, White-Breasted Nuthatch, and a Downy Woodpecker were enjoying the feeders and generally not deterred by our presence. 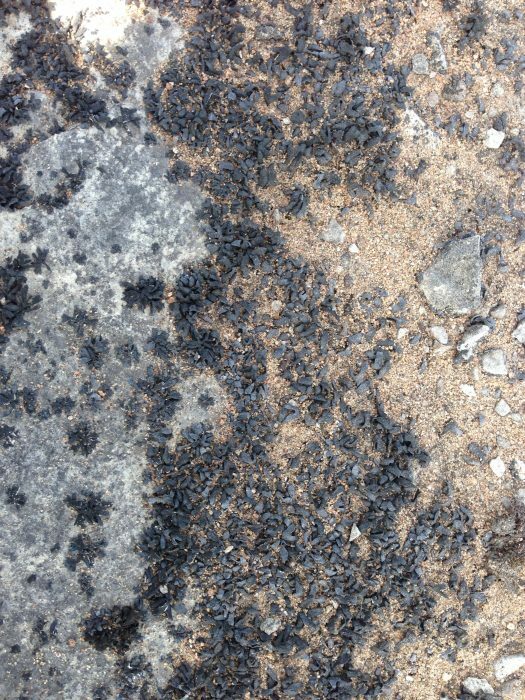 We were able to get very close looks at these individuals, and count the numbers in the area. Once we had finished our counting, we returned to the front of the trail, after Alicia gave us some interpretive lessons on what we saw. There were many woodpecker holes, and we discussed the differences in size, especially for the Pileated Woodpecker! Our next stop was to Alicia's house to see her backyard feeders, and enjoy some hot chocolate and cookies. Special thanks to Monique for supplying the goodies! 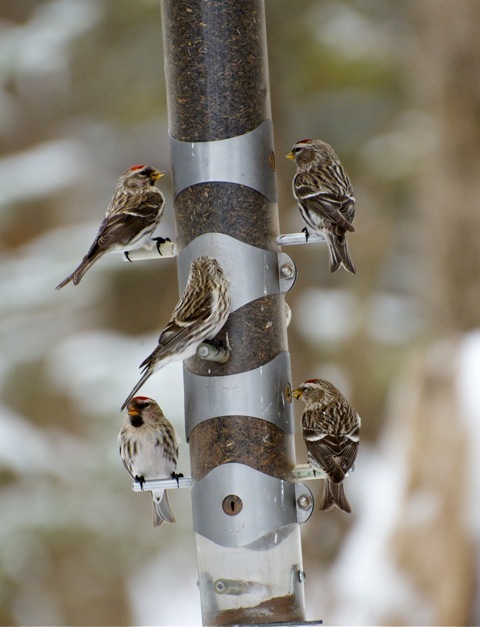 The otherwise active feeders were a little sleepy this morning, but we did see a large number of Common Redpolls. Everyone had a good time warming up inside, and having good conversation before we all had to go back to school after the winter holidays! After everyone left, Alicia reported that a Cooper's Hawk came to the feeders and scared all the birds away! The total species count for this outing was 20. Thanks to everyone who came along! On 01 September 2012, a lovely sunny day brought Francine, Gregory, Maureen, Jasper, Mark, Robert, Rowan, Elliott, and Suzanne along with our leaders, Art and Alicia, out on a Butterfly Bonanza for the Young Macnamaras. Alicia had a sample of a Monarch butterfly where we saw its front and back sides. She asked if it was a male or female specimen. 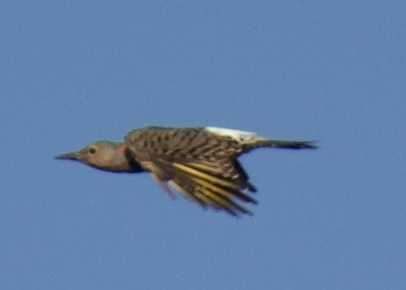 If it has a dark dot/"eyes" on its wing, it is a male. 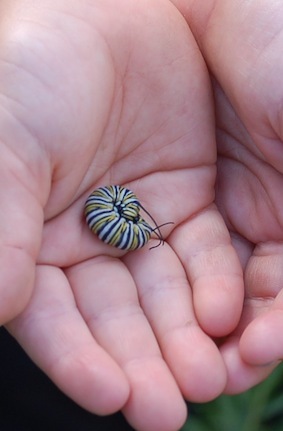 She also showed fantastic pictures of the different stages that it takes to turn into a Monarch Butterfly from egg to pupae to chrysalis to beautiful flying creature. We learned that the Monarch Butterflies migrate to Mexico and we saw a picture showing what looks like leaves in a forest but they are all migrating Monarch butterflies. Pretty impressive! 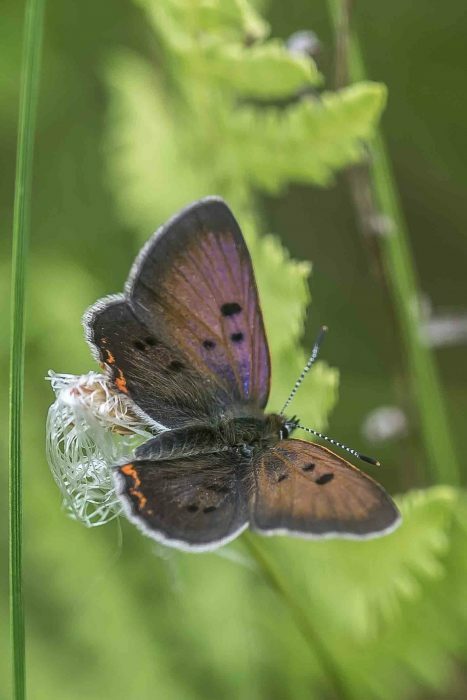 Did you know that some butterflies only live in the forest? Well it's true! Gregory was our insect-catcher-extraordinare catching whatever flew by his keen eyes and net. He was a joy to watch. The other kids enjoyed the catch and came to see whatever was being shown. The kids also learned how to be damselflies by putting their arms (wings) back and together. Jasper found a wing of a locust which was probably eaten by a flycatcher, blue jay or dragonfly. 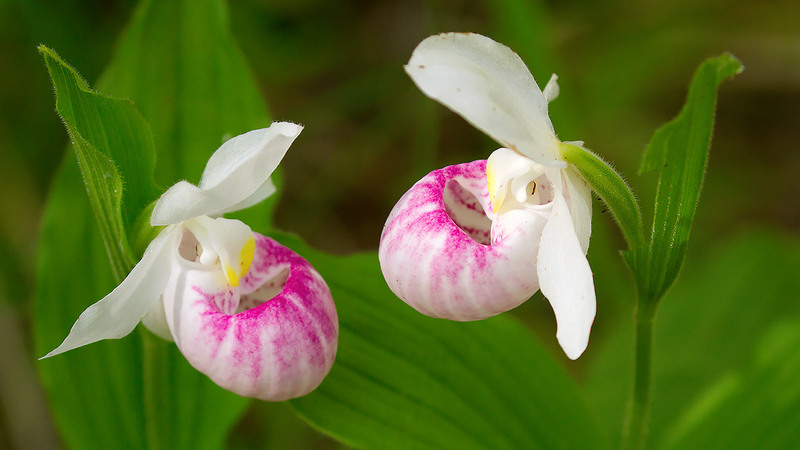 At one point, Art made us all stop for a minute and listen to the sounds of nature. It was hard. 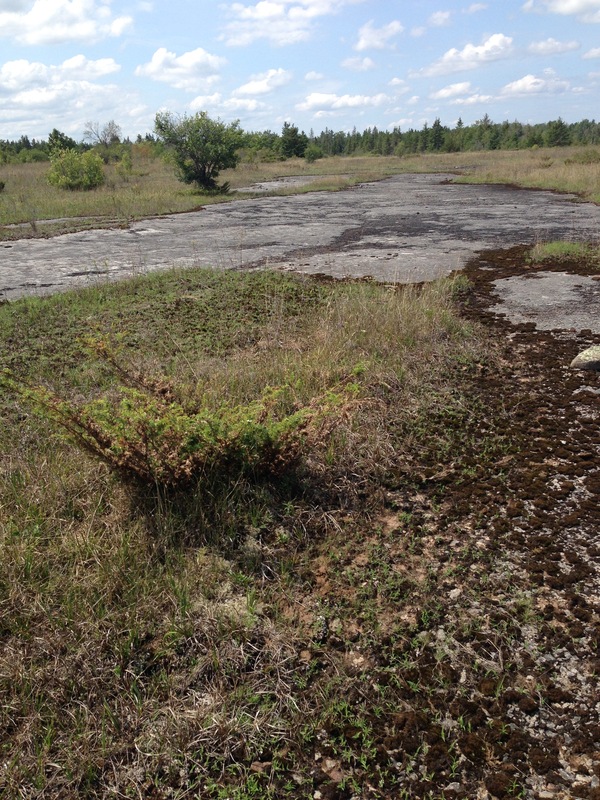 We heard lots of birds and quite possibly the seed pods breaking in the plants that surrounded us. Pretty cool! 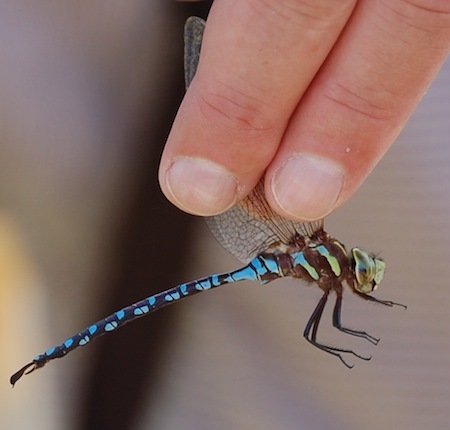 Dragonflies: Did you know that the back part of a dragonfly tail determines its species and the stigmata are the dots that you see on dragonfly wings? 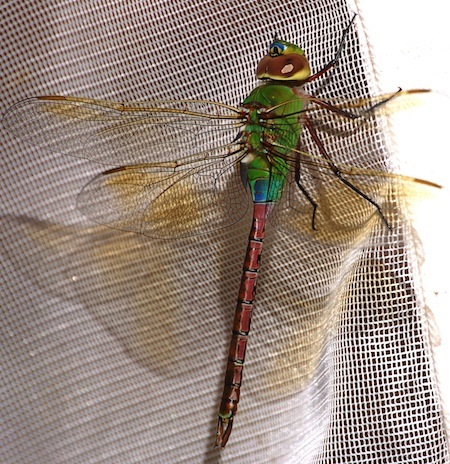 Common Green Darner (Wow! It's the biggest dragonfly in Canada and an awfully pretty dragonfly species. Wild Parsnip - Black Swallowtail Butterflies or Caterpillars feed on these poisonous plants. Marsh St. Johnswort- only flowers in the evening. 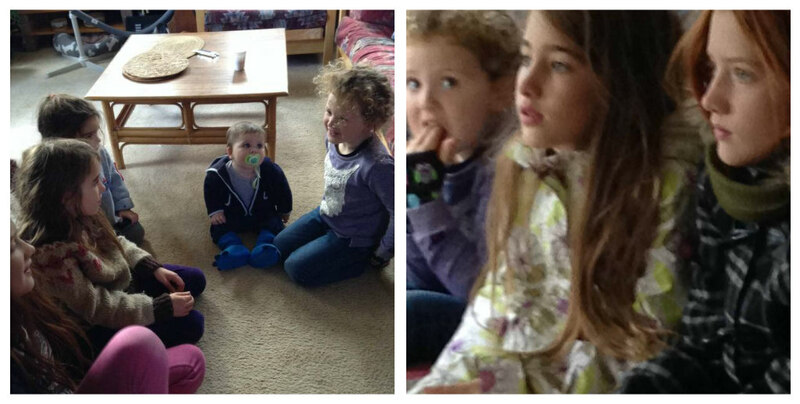 All in all, it was a marvellous day filled with lots of wonder and excitement which radiated off the kids. 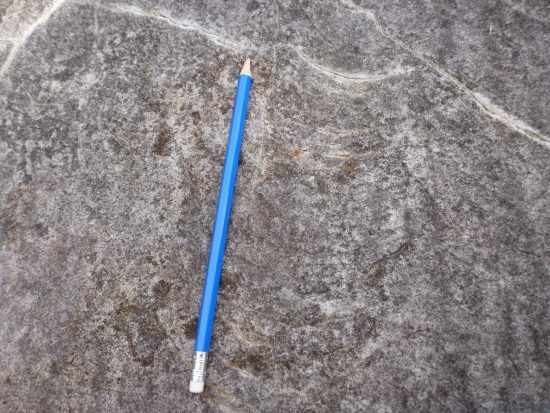 I always enjoy the Young Macnamara field trips because the information shared is easier for me to retain because it's brought down a notch...if you know what I mean. 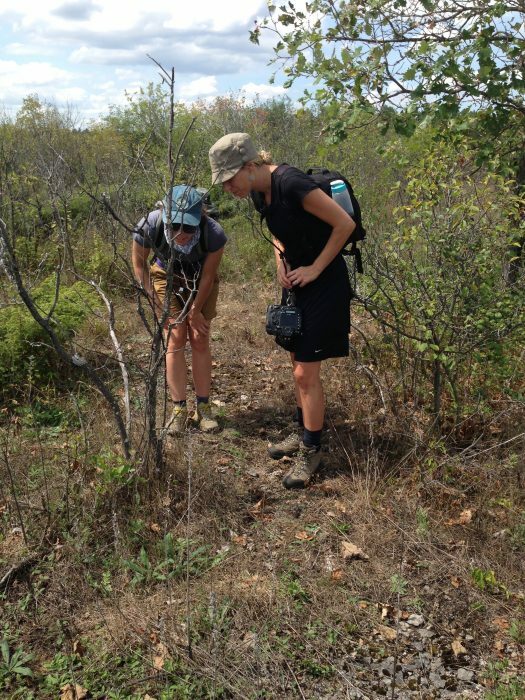 A hearty thank you to both Alicia and Art for leading the Butterfly Bonanza expedition. 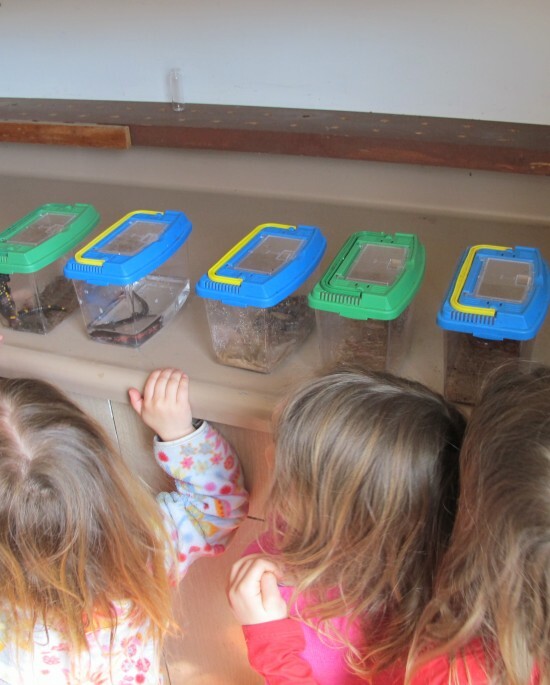 Young Macs are Toadally Awesome! On a cold, Friday evening in late March, the Young Macs ventured outside in search of amphibians. Due to the rather interesting weather we had experienced in March, we decided to go ahead and have an earlier Amphibian Walk than normal. We did find a Blue-Spotted Salamander egg mass and some really neat insects. The week before had large numbers of Chorus frogs and Spring Peepers calling, so we hoped a similar show would be there to greet us. Unfortunately, the cold weather kept our frog friends quiet, and we continued on to our second location in search of “sallys”. 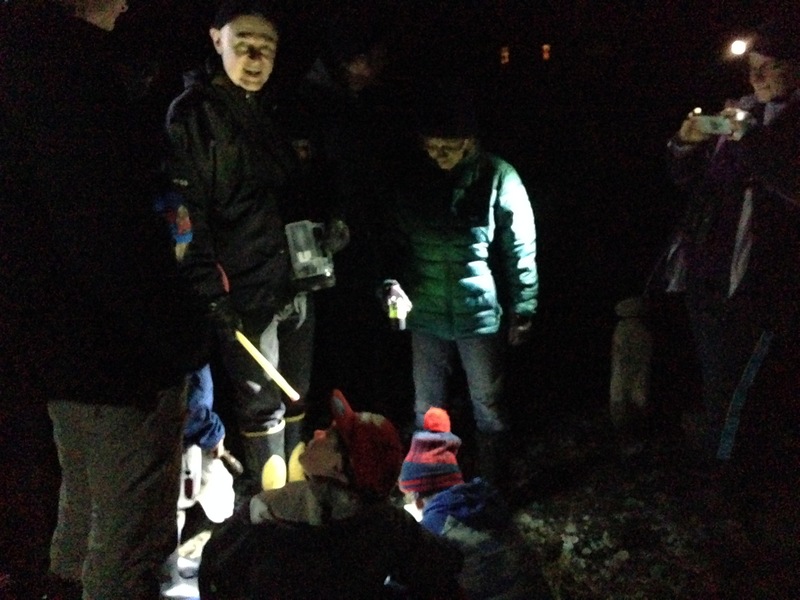 After a little searching, we were able to see a few Spotted Salamanders with their bright yellow spots, as well as a couple Blue-Spotted Salamanders, whose spots look brighter when a flashlight is shone upon them. A small group was also able to see an Eastern Newt later on in the evening. 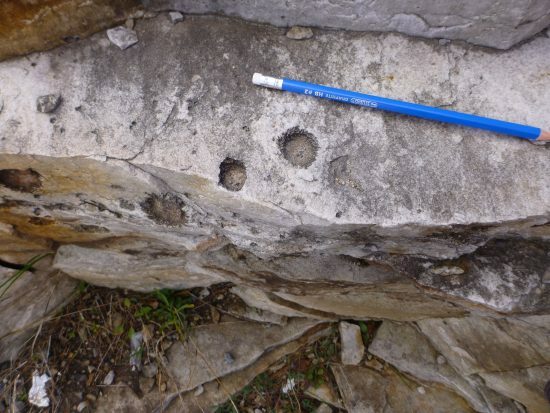 This outing was very exciting, not only for the “sallys” we found, but because it had a large number of new Young Macs joining us! 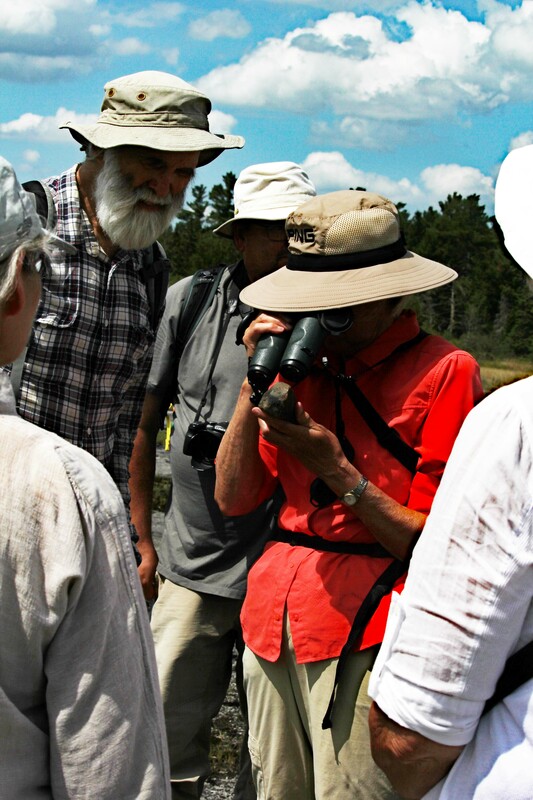 We always welcome newcomers to our outings, and we hope you enjoyed the experience you had. We were also excited to see a number of adults from the Club join us in this experience. Remember the buzz some two years ago when the Royal Canadian Geographical Society ran its contest for Canada’s national bird? 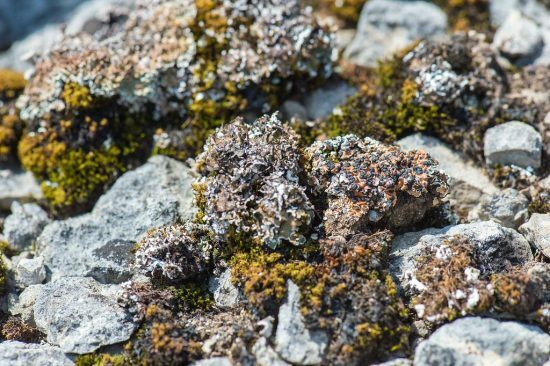 Well, this year lichen-loving Canadians will be invited to cast their vote on a national lichen says research scientist Troy McMullin, who is overseeing the initiative at the Canadian Museum of Nature. 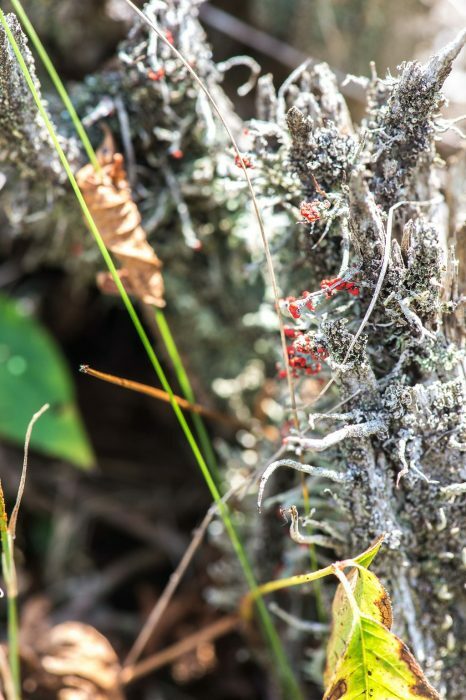 Macnamara members will recall the image-rich presentation — The Secret Life of Lichens —McMullin shared with us in 2017, underlining that the world of lichen is beautiful and fascinating. He added to that last year, pointing out examples of their remarkable forms and colours on a club field trip to find rare lichen on the Burnt Lands Alvar. “I am overseeing the initiative, but each province and territory has a representative overseeing the selection. The reps decided how it was going to be done. Some put it out to a public vote, while others selected a group to vote (e.g., those knowledgeable about lichens). 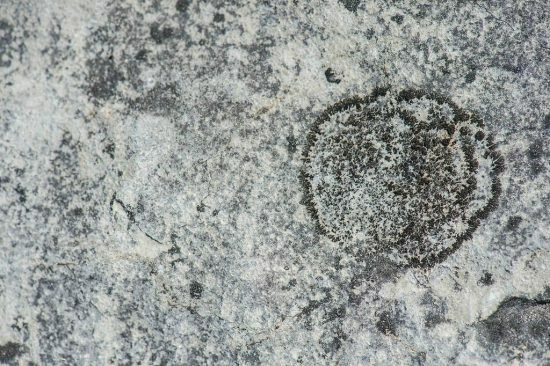 This is the process that was followed was done in Ontario, where we have a new [provincial] lichen selected,” he added. 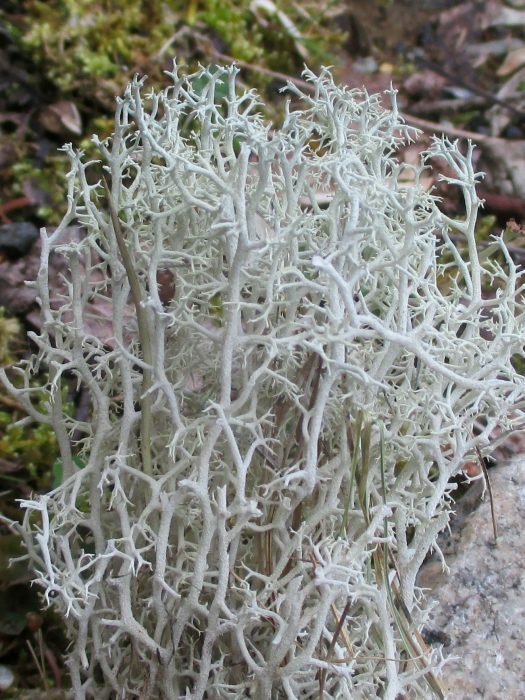 The same site reports that that Newfoundland has chosen the Newfoundland reindeer lichen Cladonia terra-novae and that New Brunswick has chosen the Beard lichen, Usnea longissimi. 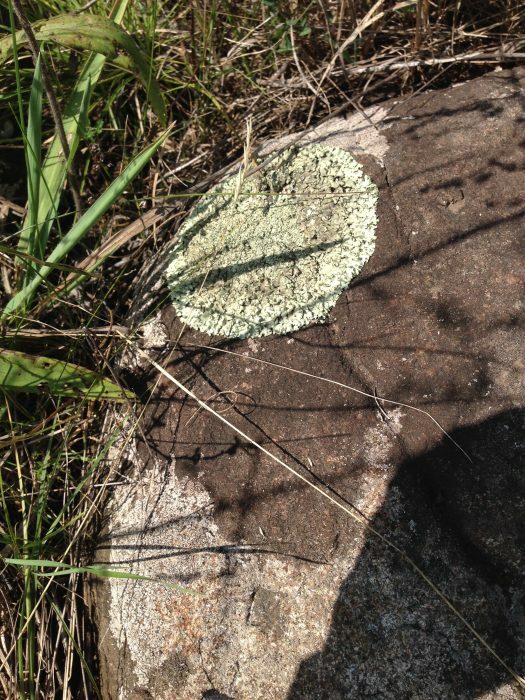 As McMullin says in a CBC article, “The main goal of the project is to simply increase the awareness of lichen, not necessarily to push for the provinces to officially adopt them as symbols, he said, but noted that would be ‘amazing.’"
"They're abundant, they're beautiful, they're important and they're under-appreciated. 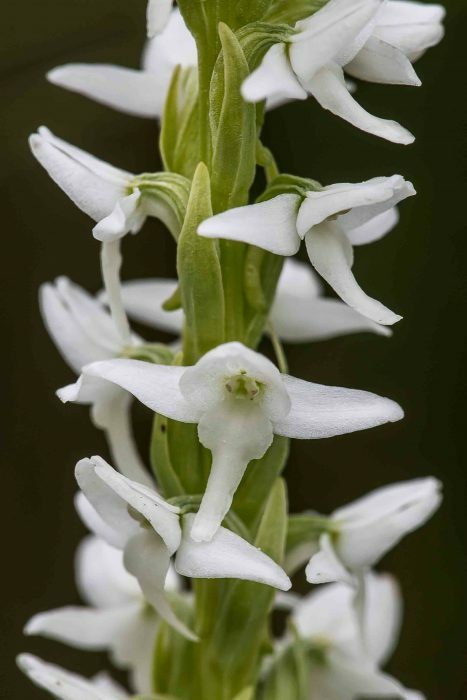 Hopefully this process will draw attention and raise their profile a little bit." McMullin promised to let us know when the voting site for the national competition is up and we’ll be sure to share it with you. .
Use Twitter? You’ll find him there as @TroyMcMullin; you’ll find us there as @MacFNC. Eight spirited teams in search of answers and bragging rights studied specimens displayed on tables and computer screens. 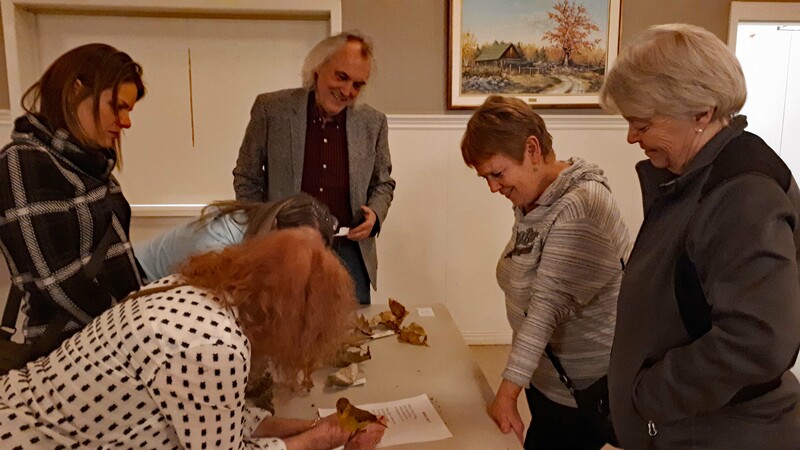 Yes, it was Michael Runtz's annual mind-stretching nature-themed quiz. The result — a near-photo-finish between the Busy Baffled Beavers led by Maureen Carrier and the Know It Owls led by Janet Mason. With all the "fierce" pumping-for-points do we dare declare a winner? Other teams (exact names to be confirmed!) 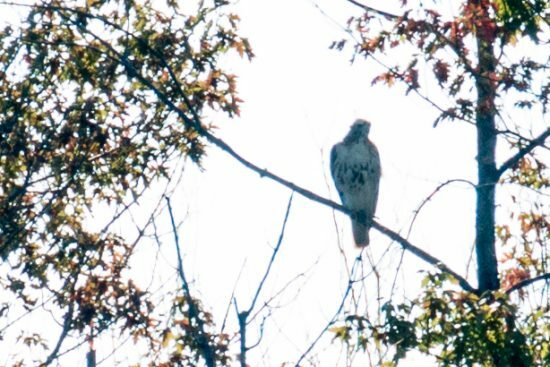 included: Great Grays, Spring Peepers, Mad Harriers, Charlies' Chicks, Foxy Femme Fatales, and the BLT: Birds, Leaves and Trees. 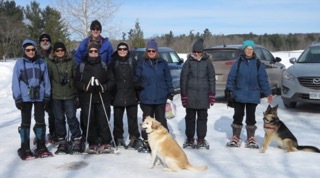 We had perfect weather and trail conditions for our annual snowshoe event, held once again in Fitzroy Provincial Park, on Sunday, 17 February. 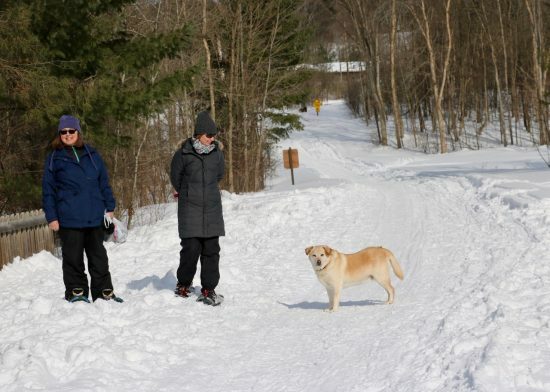 Club member Karen Krueger, frequent park visitor, led the group over the Carp River bridge and onto unofficial winter snowshoe trails to secret groves and escarpment vistas. 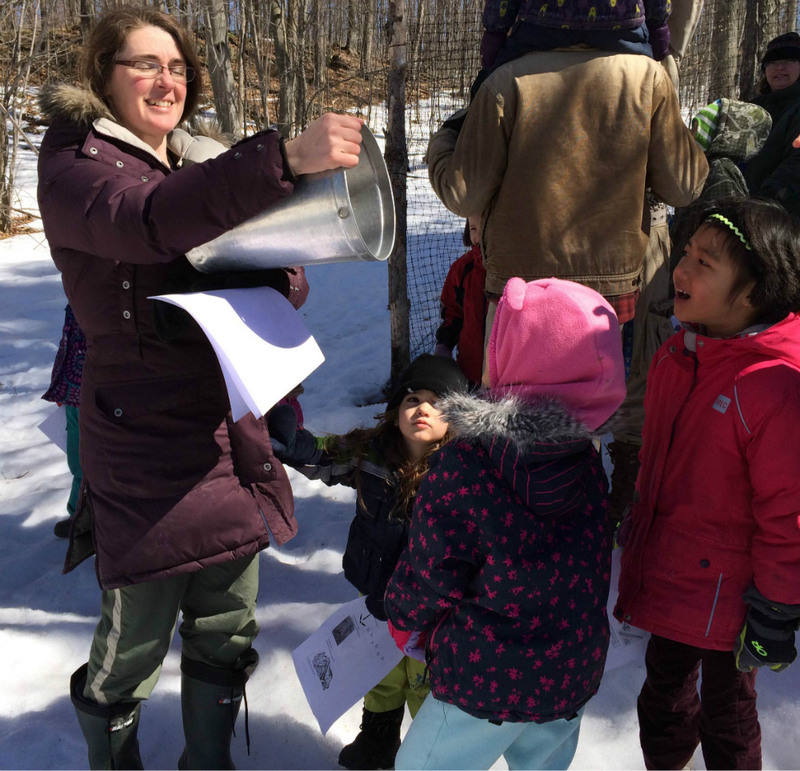 Laden with bird seed, Karen restocked the network of bird feeders where chatty chickadees lit gently onto our outstretched hands for sunflower seeds. 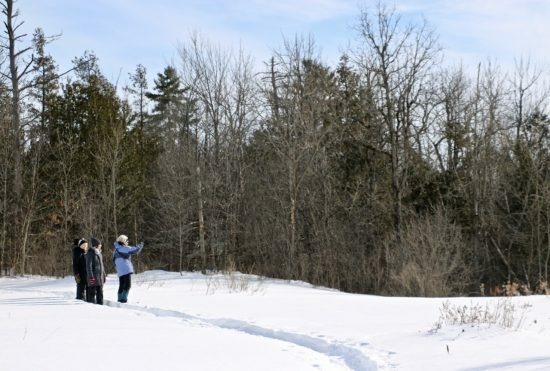 We stopped to look for raptors in the open hydro corridor near the summit of the escarpment, enjoying the warm sunshine and stunning view down to the frozen Ottawa River in the distance. 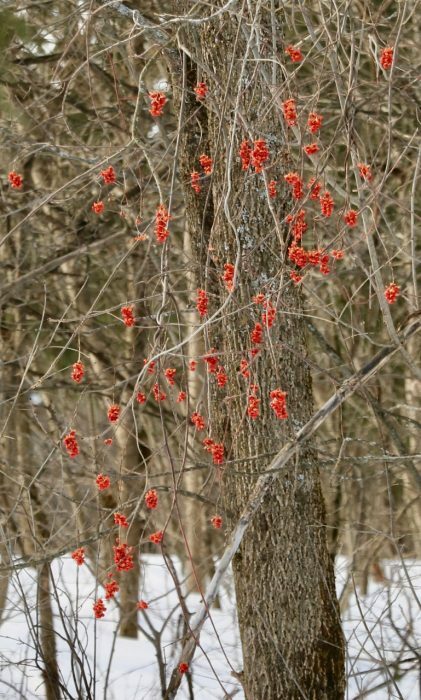 We spotted female American Bittersweet (Celastrus scandens) vines brightening the landscape with their ripe orange fruit. 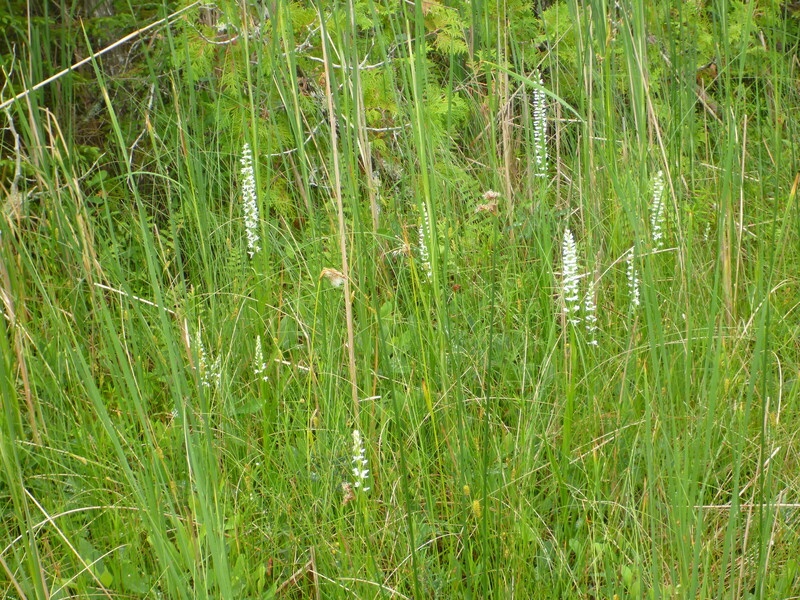 Bittersweet has male and female plants, which must be close together for fruit production to occur. 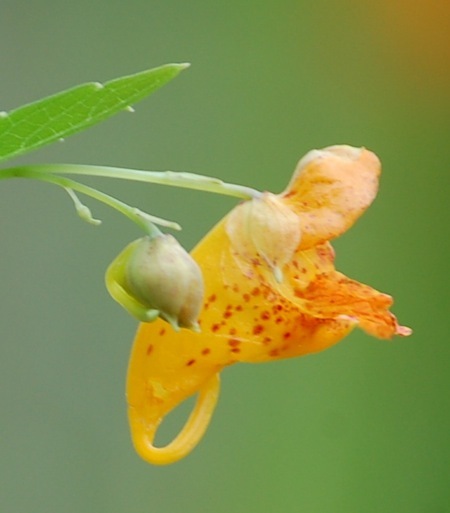 American Bittersweet is a native vine that can grow well over 30 feet, twining high up into the bows of supporting trees. 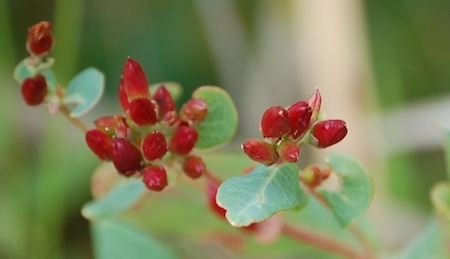 It can be distinguished from the aggressive Oriental Bittersweet (C. orbiculatus) by the arrangement of the fruits, which cluster at the end of the stem in the native plant compared to along the stem in the non-native Asian variety. 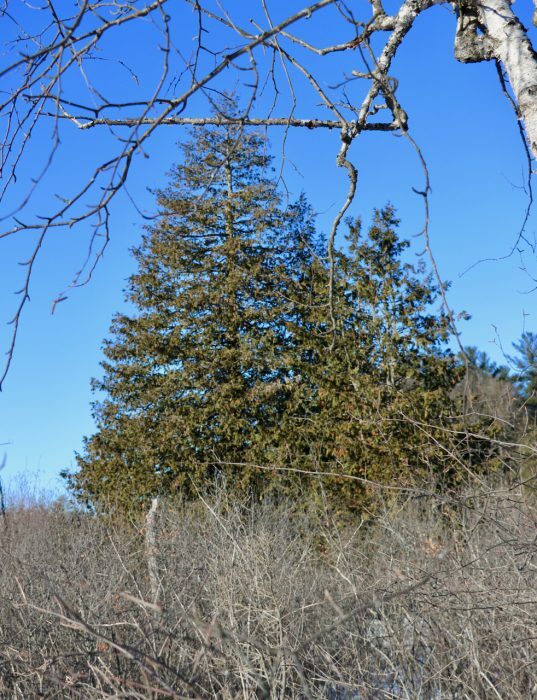 On our way out we admired the tall White Pines (Pinus strobus) and mature Eastern Hemlock (Tsuga canadensis) lining the main road to the beach. 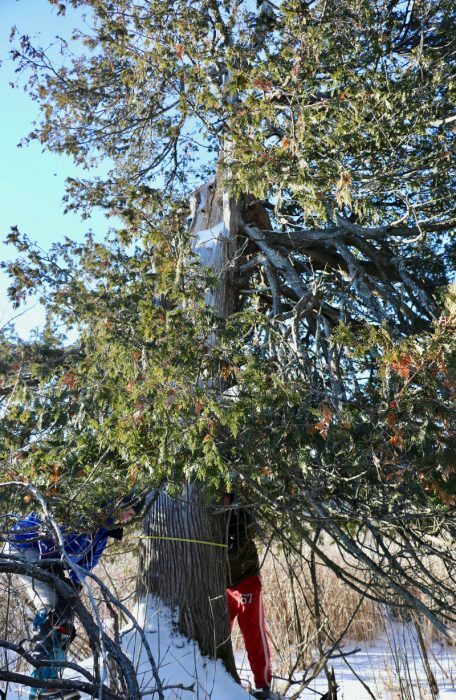 The park’s tallest White Pine has been measured at 36 meters, which compares to the tallest White Pine in Ontario at Arnprior's Gillies Grove, measured at 47 meters. 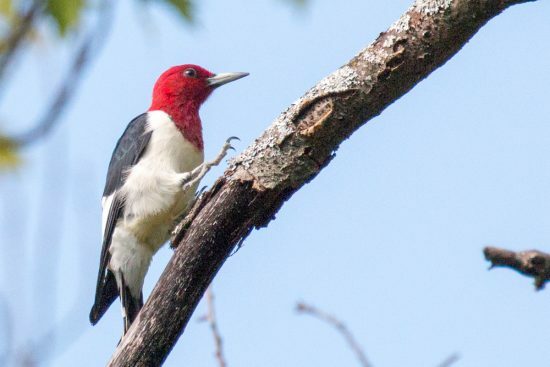 Betty kept the bird sighting log: Blue Jay (3), White-breasted Nuthatch (5), Black-capped Chickadee (20), Hairy Woodpecker (5), Pileated Woodpecker (1 heard ), American Crow (2). Refreshed by our two hour snowshoe, we gathered at Karen’s house near the park for refreshment of a different kind to share stories and good company. “I want to report a very old tree,” said Kevin Keough, announcing an unusual sighting among all the expected bird and mammal observations reported by members at the Club's January meeting. 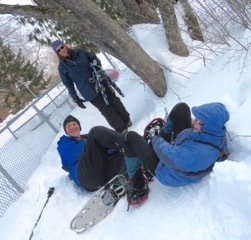 Kevin and his wife Agnieszka had been exploring the frozen reaches of Goodwin Marsh by the Macnamara Trail. 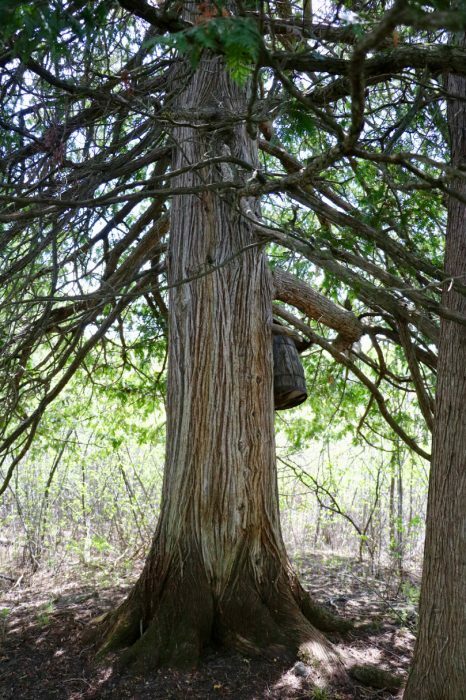 He described the tree as a stout, heavy-limbed, and very healthy Eastern White Cedar (Thuja occidentalis). My interest was piqued! 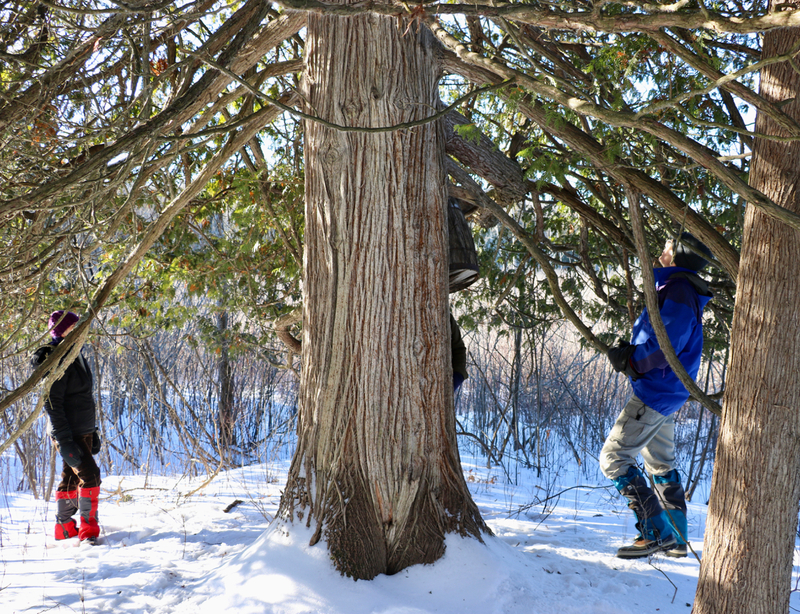 I arranged a visit to the tree by Owen Clarkin, well-known tree enthusiast with a deep knowledge of tree ecology. 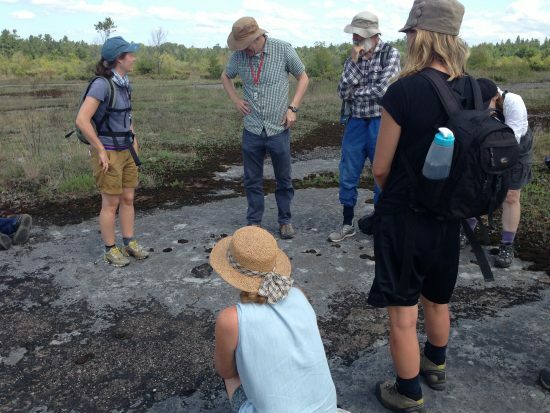 On November 18 we managed to get 18 participants into 5 vehicles (a tremendous feat for an MFNC outing!) for a birding trip in the Arnprior area. 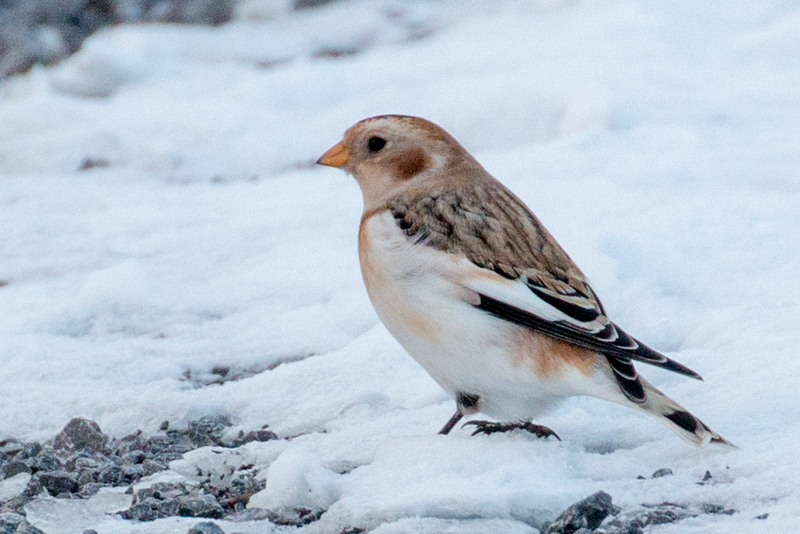 Led by Sophie Roy, we were searching for raptors and some of the winter rarities. 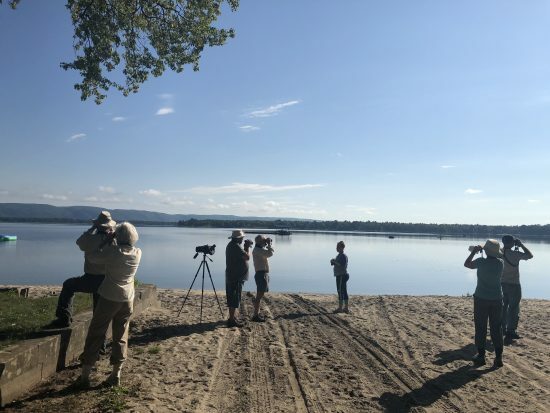 We found 16 species of birds. Highlights were: 3 Red-tailed Hawks, 1 American Kestrel, 5 Great Black-backed Gulls (which were a life bird for a few participants) and 3 Snow Buntings (which posed for excellent pictures). 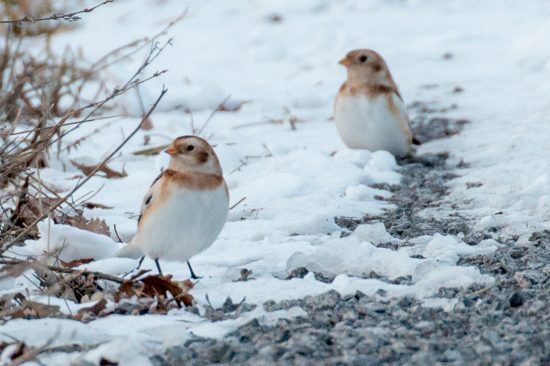 There were fewer birds than on previous outings at the same time of year and this seems in keeping with what other observers are finding. Thank you Sophie for leading us and Ian Somerville for the pictures. 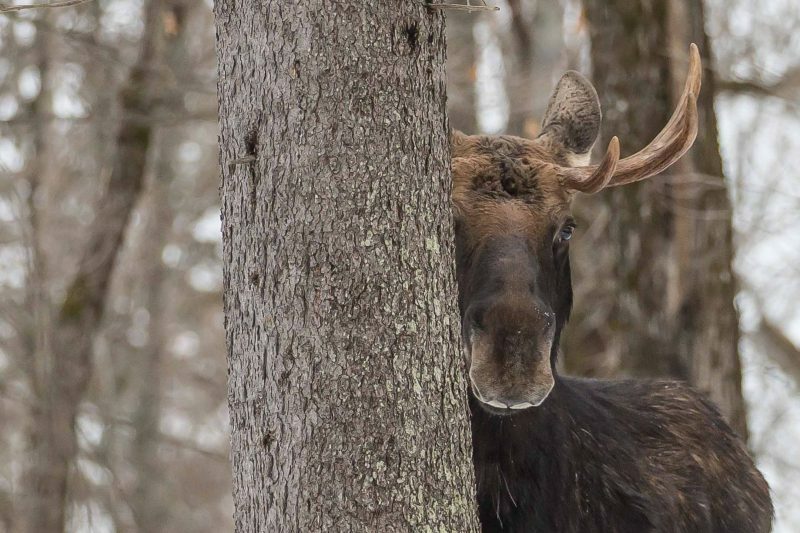 This intriguing “you-don’t-see-us” photo from his upcoming book, Algonquin Wild, was one of the fabulous photos and back stories Michael Runtz shared at our 2018 banquet in his visual exploration of the changes in Algonquin Park’s flora and fauna through the course of a year. 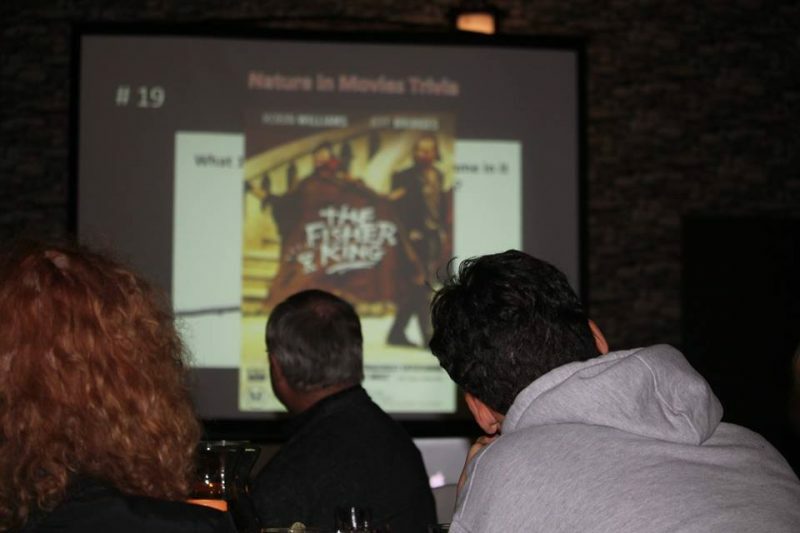 Michael first delivered photos and puns served up with dessert and coffee in a new “movie-related” quiz that drew groans as well as laughter. 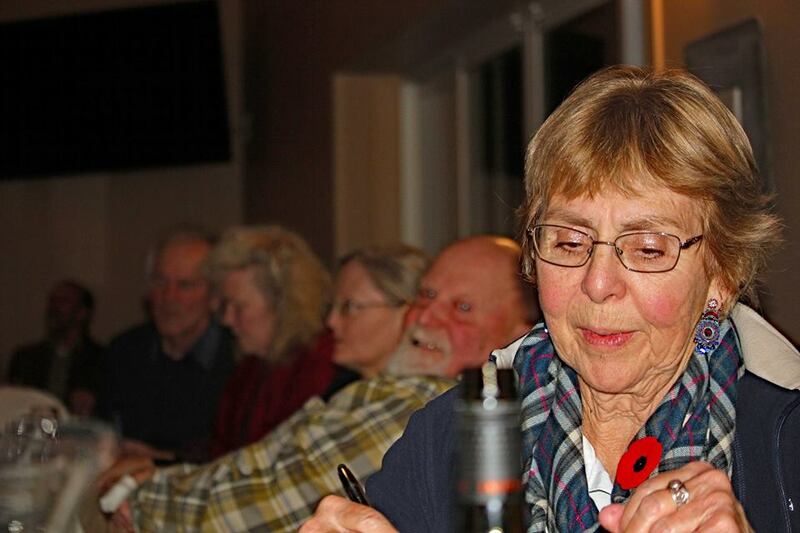 Here Olga Janoska records one table's answers to the quiz. 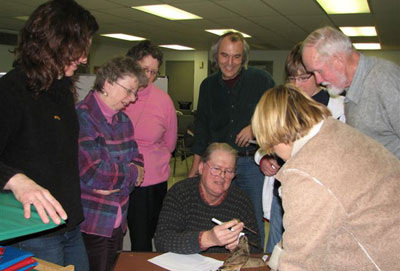 In the background, the table that took top bragging rights: the Meagre Beavers’ team of Eric and Katharine Fletcher, Michael Peterson and Trish Murphy, John and Christine Tammadge, Art Goldsmith and Janice Tripp. 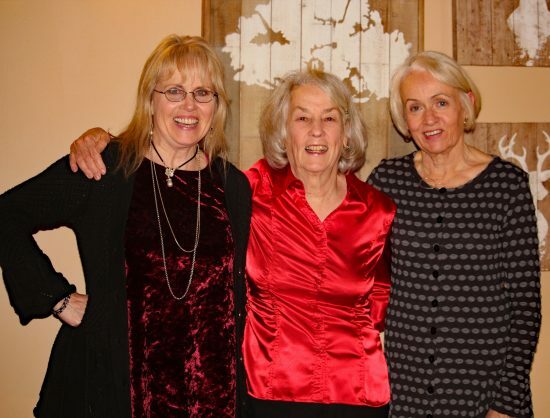 Thanks to Judy Seligy (centre), here with helpers Ann Mayall (left) and Maureen Carrier (right), for pulling together all the elements of the banquet for five years running. 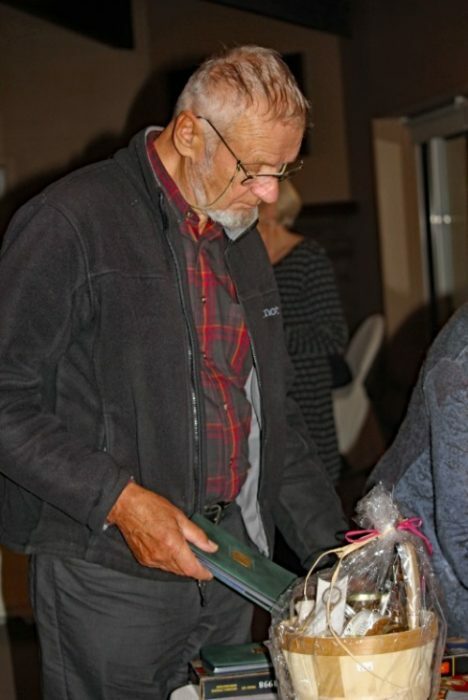 The return of the silent auction made many banquet goers very happy, especially those with winning bids. Here Berhard Gesicki checks out one of the more than 40 items sold. 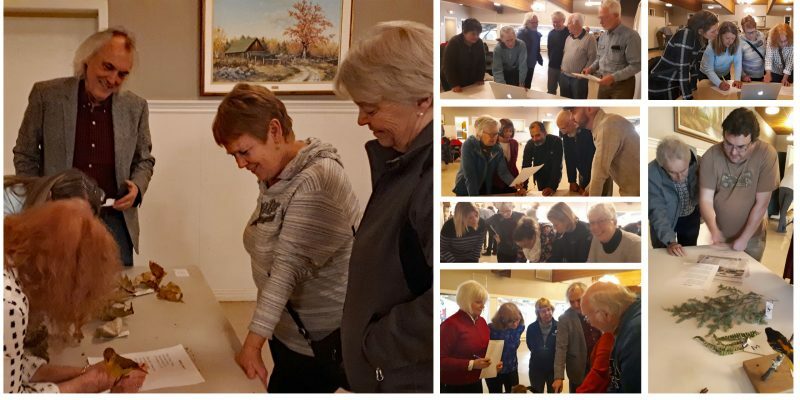 Our club cleared close to $3,700 from the banquet, taking into account proceeds from the silent auction, book table and sale of tickets. 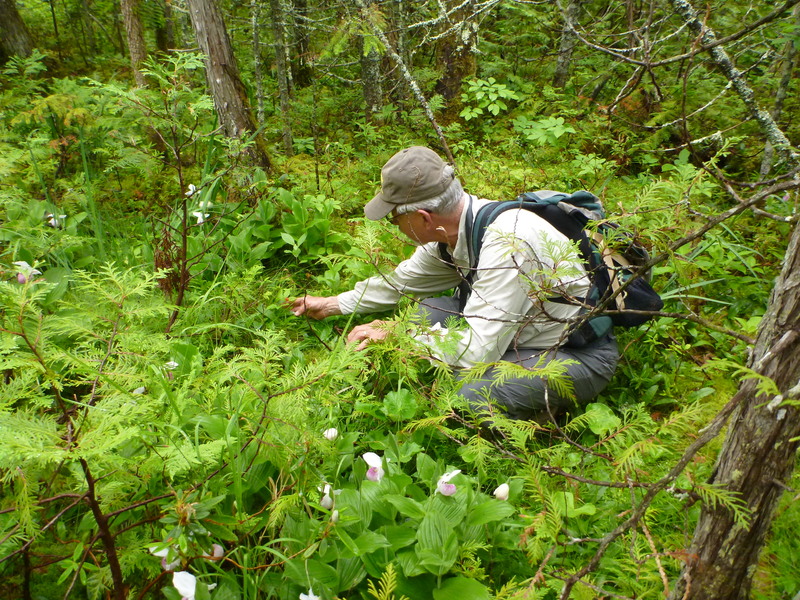 All net proceeds go toward the MFNC’s operating expenses, which include the maintenance of the Macnamara Trail. 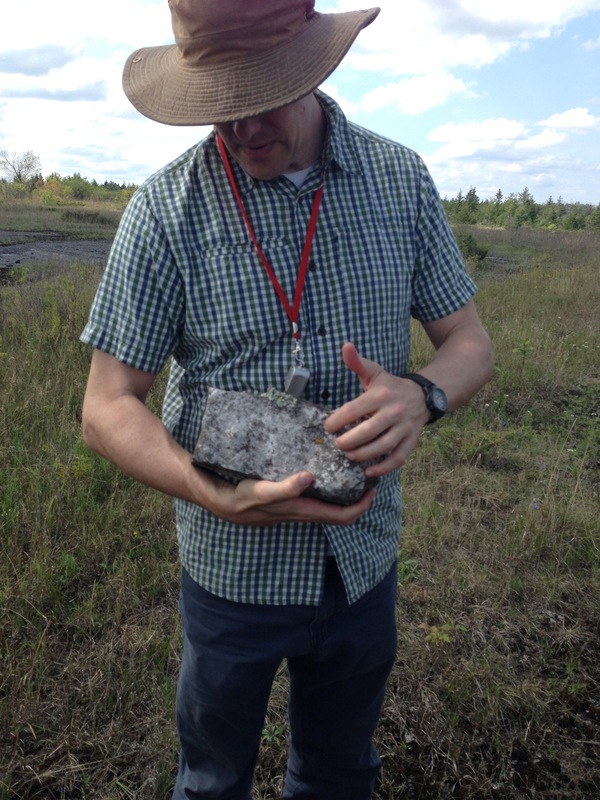 It was a great way to spend a Saturday for the lucky group who joined Wouter on a tour around the Ottawa area. We met at Starbucks in Kanata Centrum and nearby in the mall was our first stop. 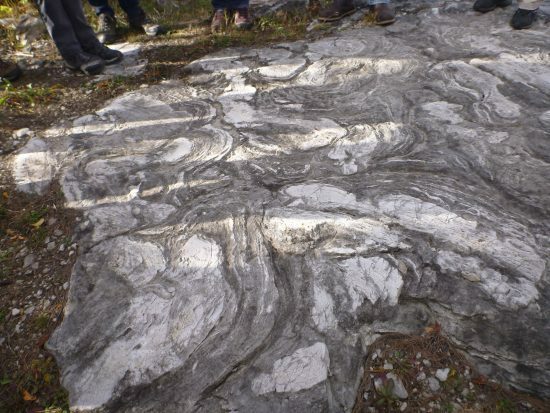 Here we had an introduction to local sedimentary rock stratigraphy and looked at the Nepean Formation sandstone, of about 500 Ma, with a variety of features. 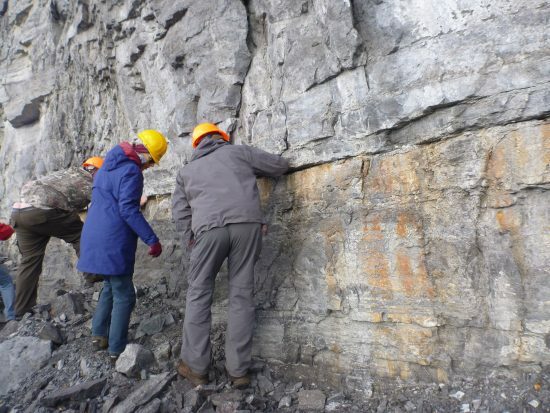 There are very interesting stromatolite fossils which are a little disorganized looking, perhaps they experienced some disturbance long ago, such as an earthquake or a hurricane. Also in this area are concretions in the sandstone, holes left behind as crystals dissolved away. 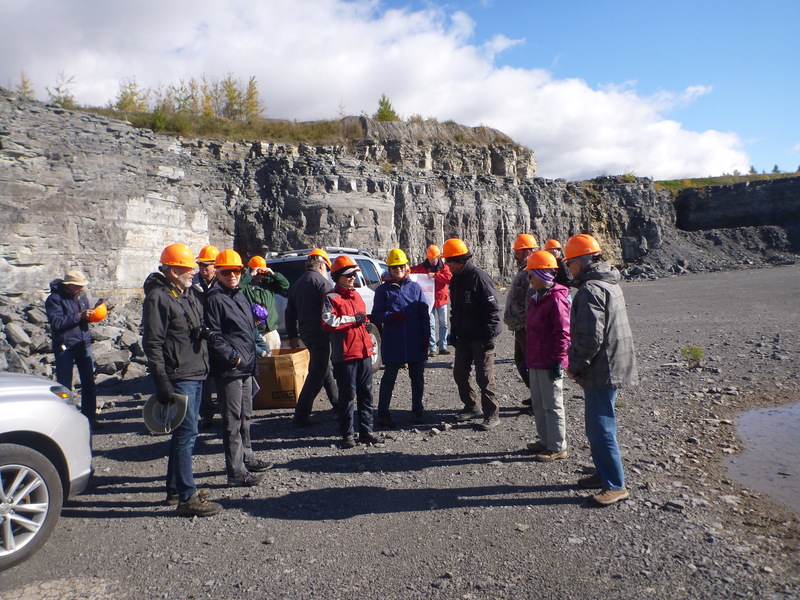 Second stop was the Clark Quarry in Stittsville where we donned hard hats and wandered around looking for fossils while being awed by the towering layers of limestone (about 450 Ma) and observing a cross section of a major fault system. 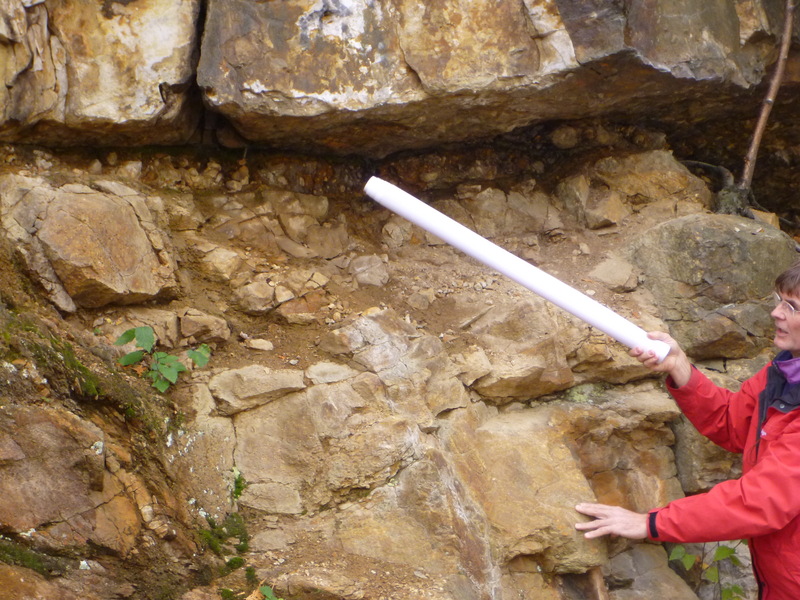 Dr. Bleeker is studying this system and attempting to determine the time the faults occurred. 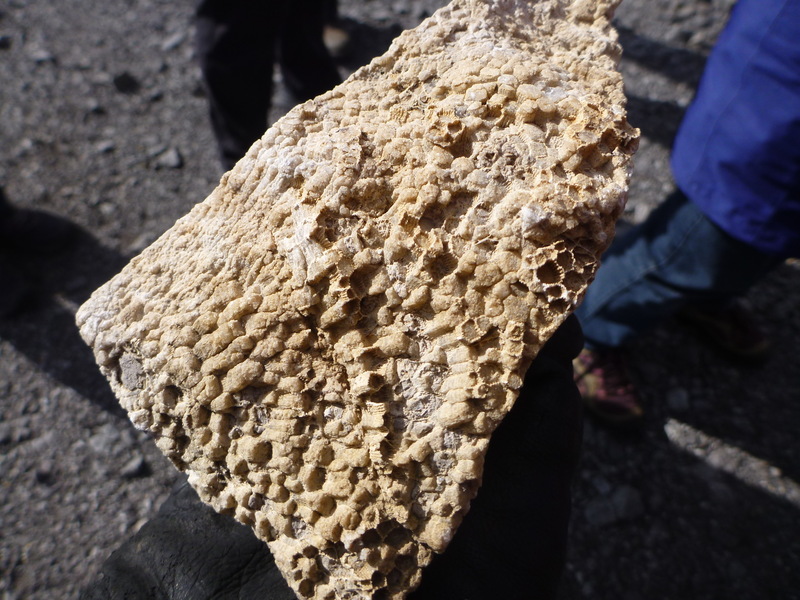 Also found there are two bentonite layers in the limestone. 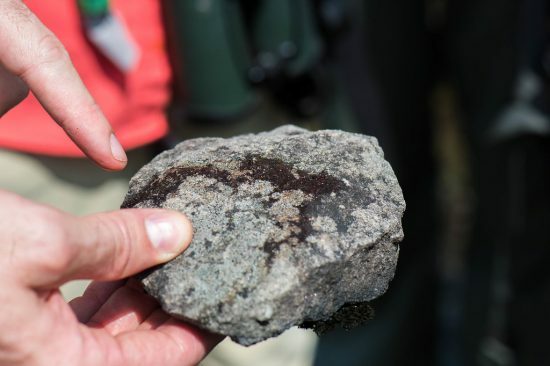 These are ash layers from an ancient volcano which was located somewhere in the Carolinas. 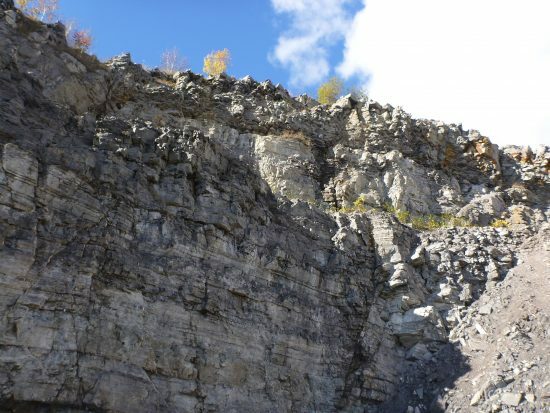 The eruptions were about 2 million years apart! Next we crossed the Ottawa River and made our way to Parc Lac Beauchamp in Gatineau where one can clearly see the unconformity between the basement rock of about 1.2 billion years old (which has been tilted, uplifted and eroded) and the sandstone layer. 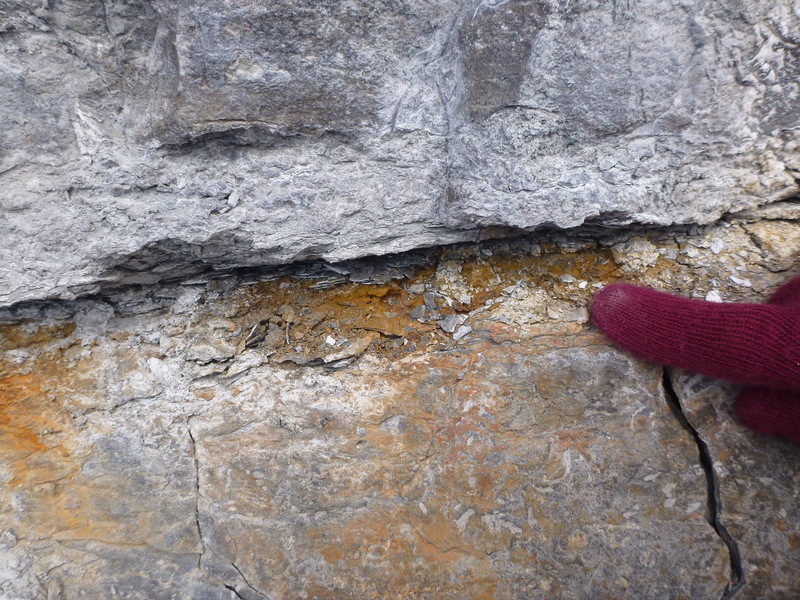 Between the two layers are 100s of millions of years missing! Nearby we also found excellent examples of glacial striations and chatter marks. Last stop was the Champlain Lookout where the Eardley Fault brought the ancient Grenville basement layers up to overlook the much younger sandstones and limestones of the Ottawa Valley below. We are very much looking forward to continuing the story next year with Wouter. Chatter Marks. They line up N-S so could help you find your way. 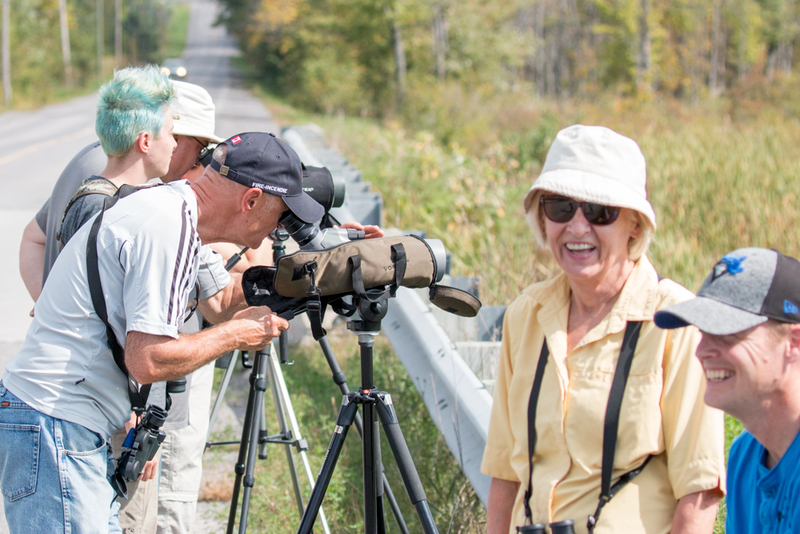 A group of 20 bird-watching Macnamarans spent a very hot sunny morning touring the Dunrobin/Constance Bay area. 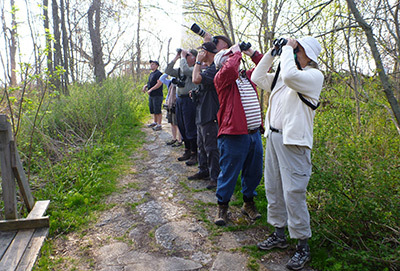 With 40 eyes and ears and a few experts in the group, we were well rewarded with good numbers of birds and a good variety of species. Below are the areas covered and some highlights from each location. I have not listed every species. 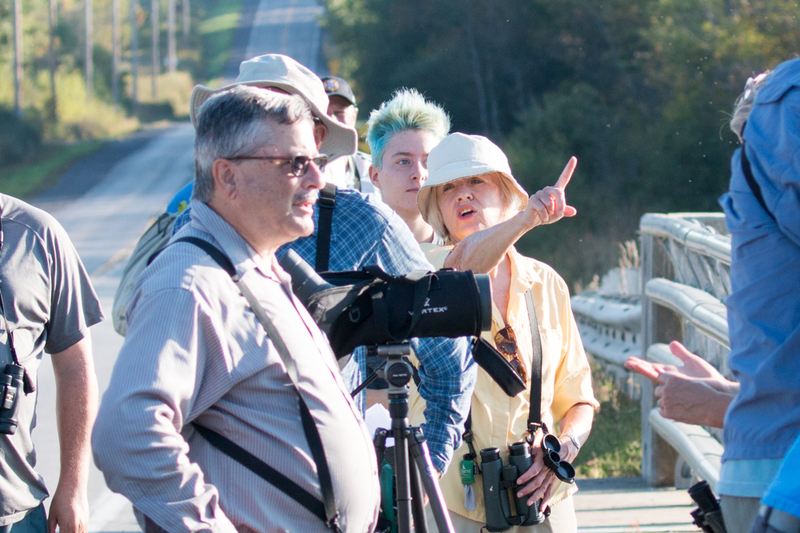 A few of us headed over to the wetland on the Berry Side Rd.early in the afternoon to add a few more birds to the list. This tends to be a really good area in the spring. A lichen is composed of two different organisms - fungus (95%) and alga (5%) - living together as one. 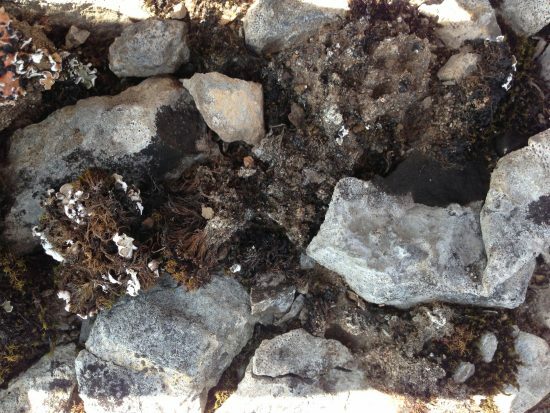 Different lichen species are found on different rock types: granite (acidic) vs limestone (basic). 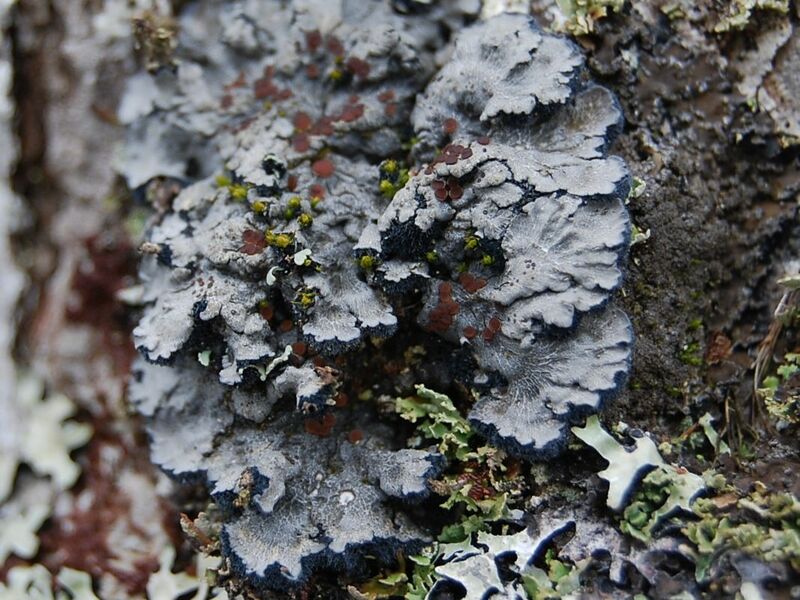 There are 17,000 species of lichen with 20 to 30 algal partners available. The fungus surrounds a colony of algae; algal cells provide food for the fungus via photosynthsis and the fungus provides support for the alga and protects it from drying out. The fungi which find themselves in these symbiotic relationships with algae are no longer found free-living. Lichens grow very slowly, as little as 1mm/year. They have many interesting methods of reproduction, the simplest being by fragmentation. 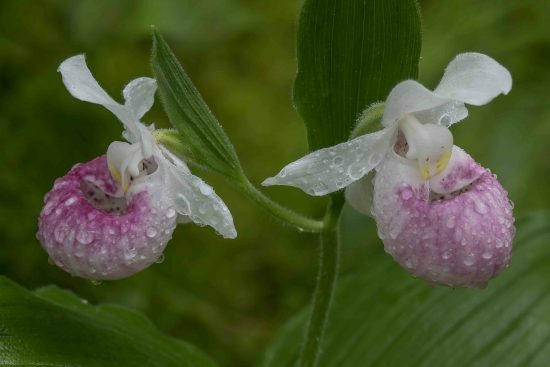 Ever wonder why a forest is so green after a rain? 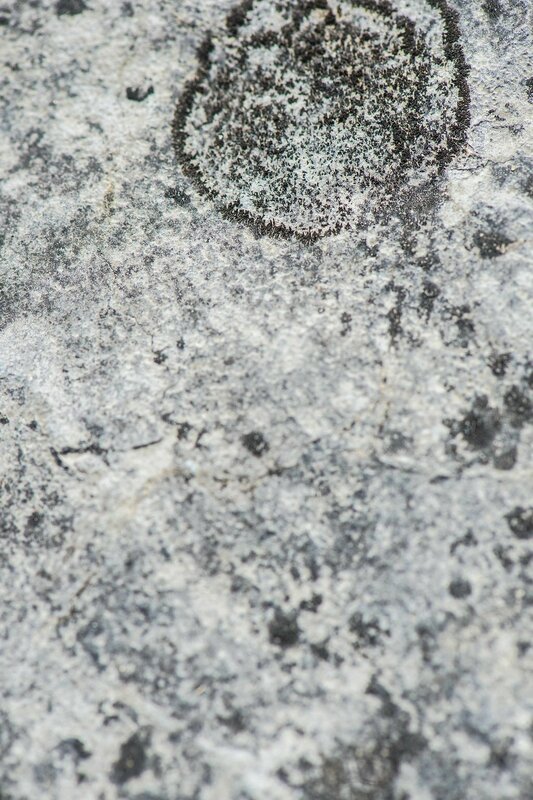 Well, when wet, the lichen is green due to the alga. 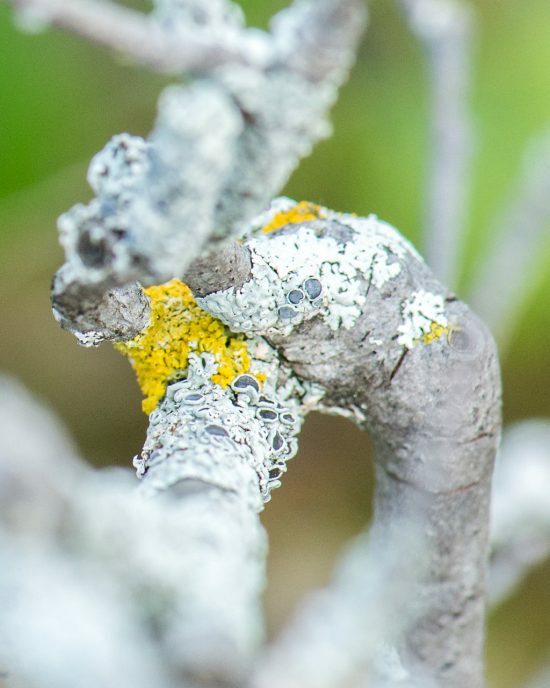 On one small tree branch we found 7-8 different species of lichen. 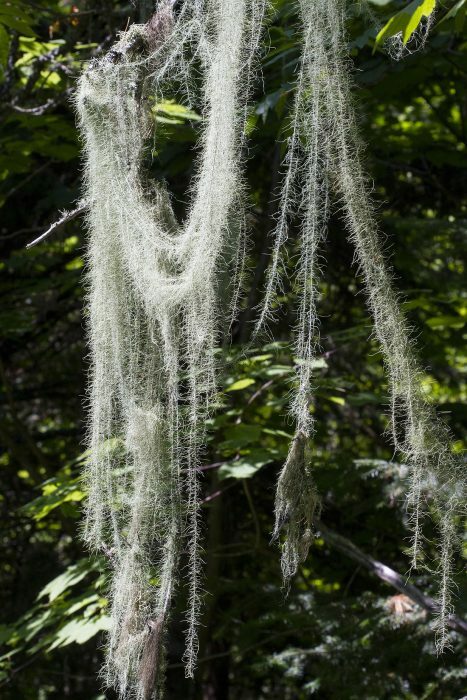 Tree species that are good to poor hosts for lichens: oak, maples/cedars/cherry, conifers, birches. 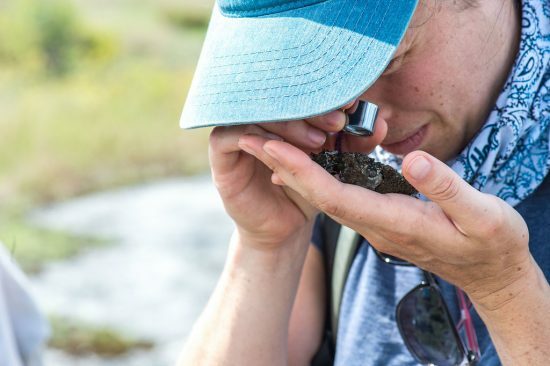 There was so much new information to take in about these fascinating organisms and above is only a small part of it. A lot was learned by the participants--thanks Troy! We tallied 25 bird species along the way, including three species of thrush (Wood, Hermit,Veery) and a Winter Wren, in the cedar forest leading to the fen. 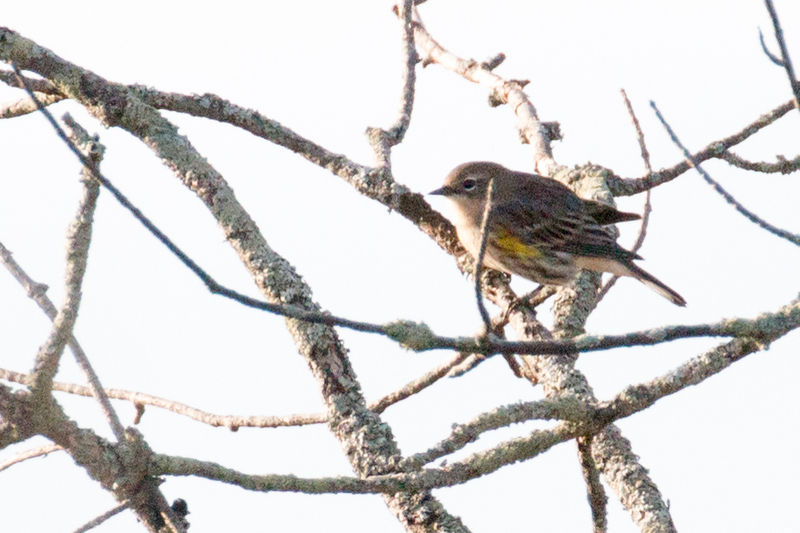 As usual, Nashville Warblers and Common Yellowthroat were plentiful in the fen and constantly singing to us along the way. 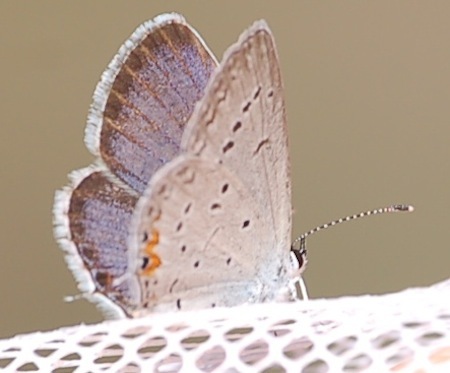 There were dragonflies, damselflies, moths and butterflies to capture our attention as well along the way. 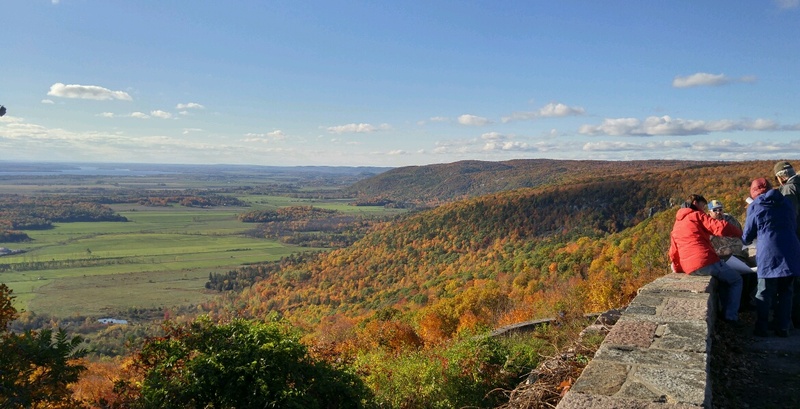 A perfect day to enjoy this magnificent location. 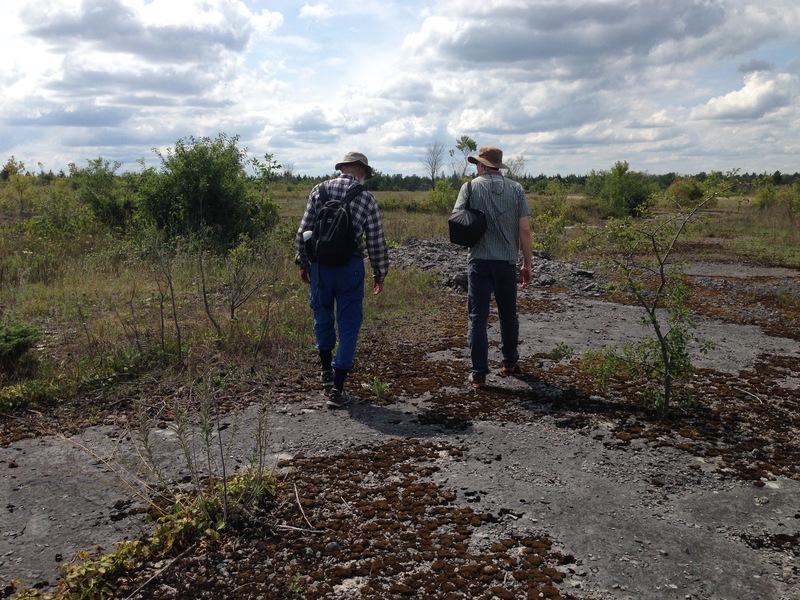 Many thanks to Michael Runtz for leading us there! 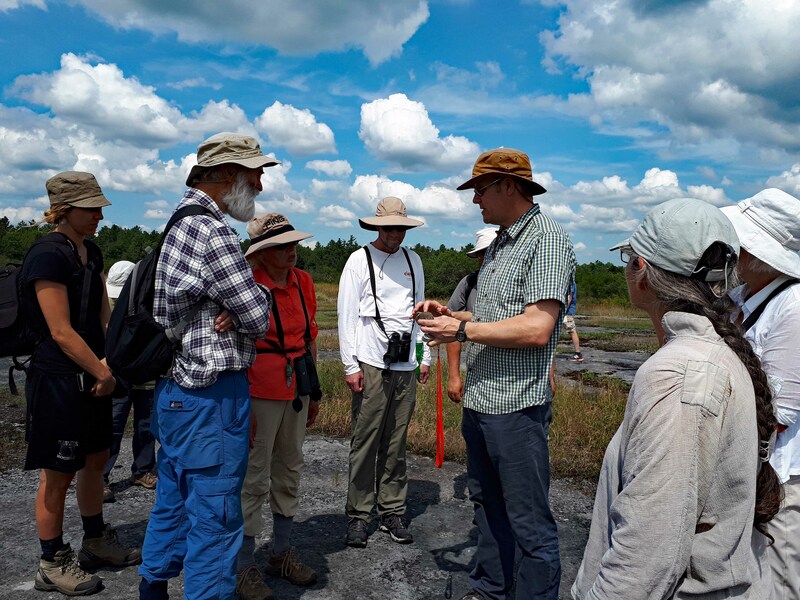 Our group learning more about fen ecology before heading in.